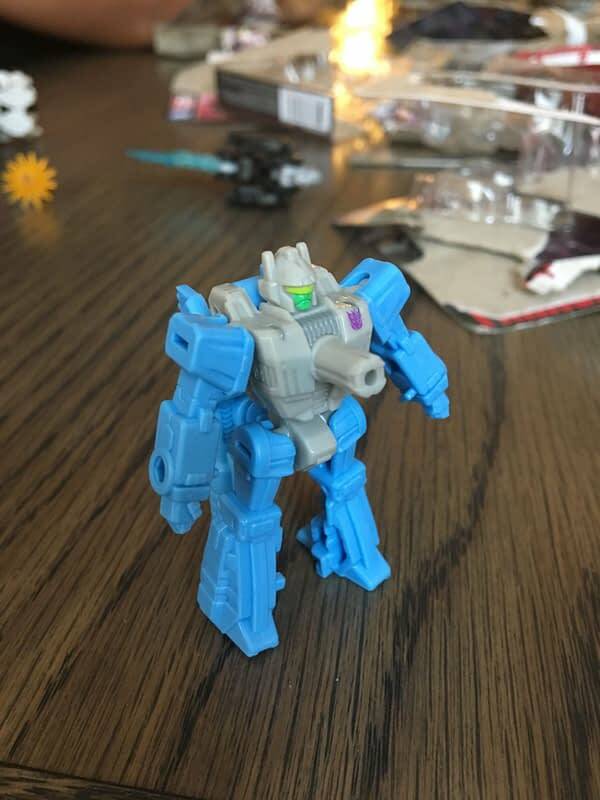 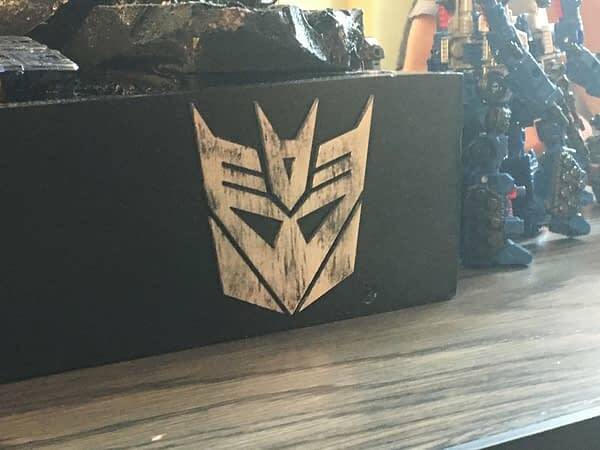 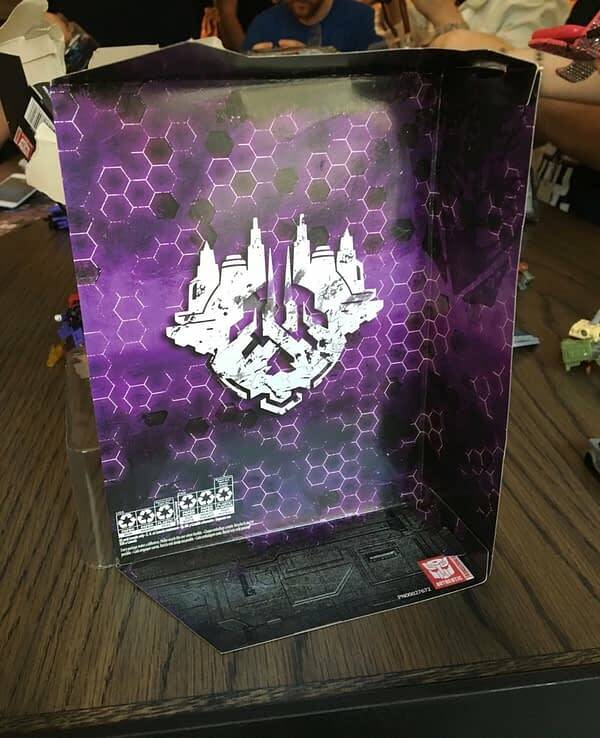 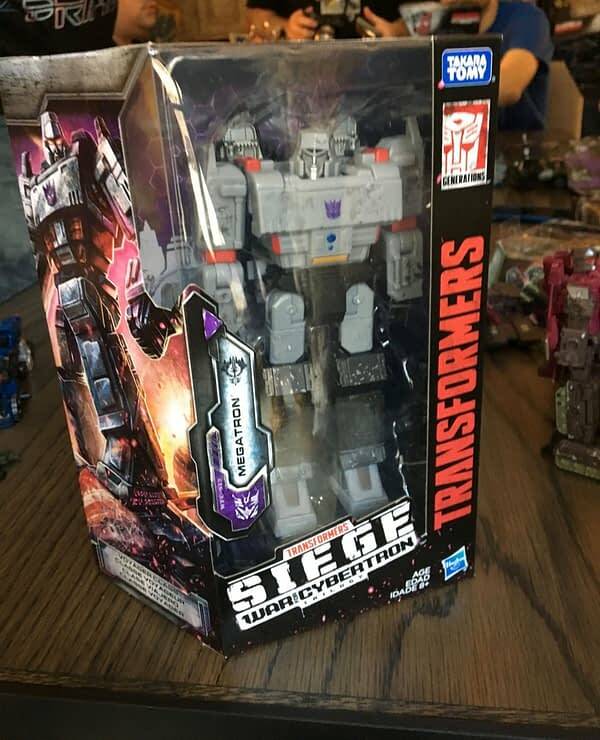 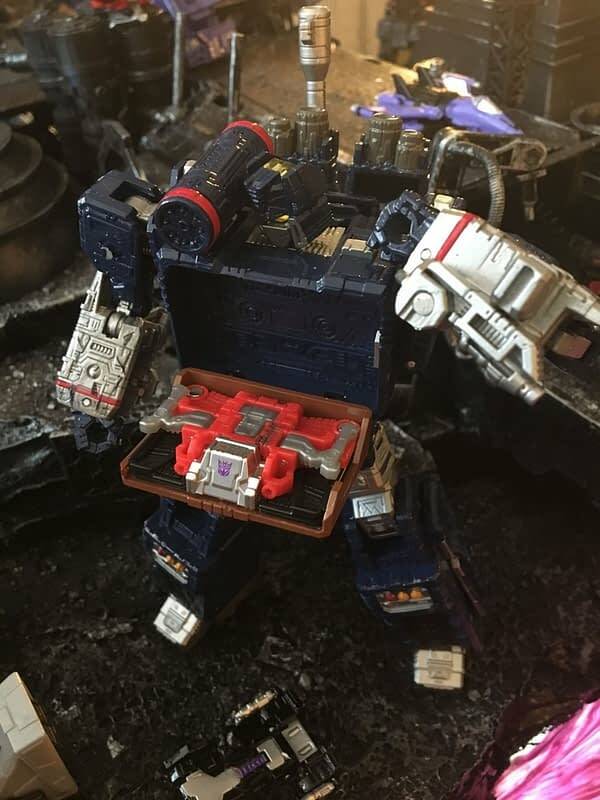 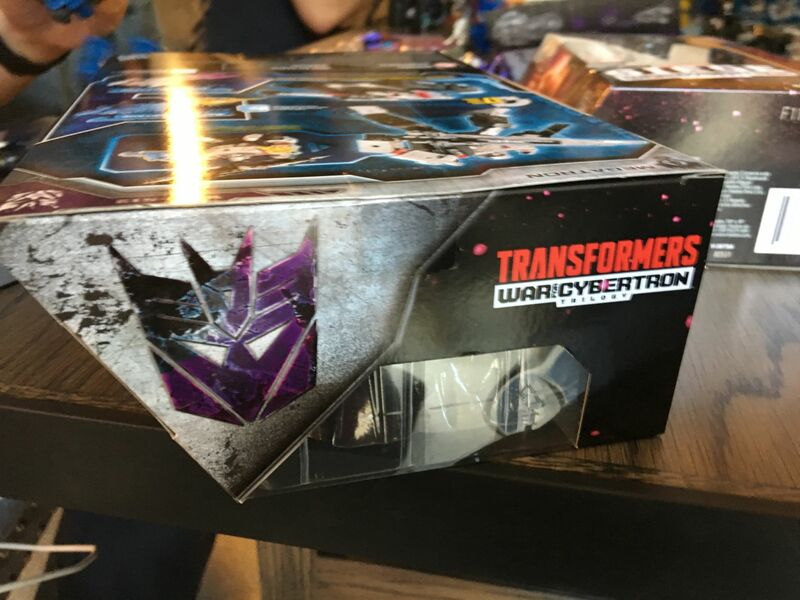 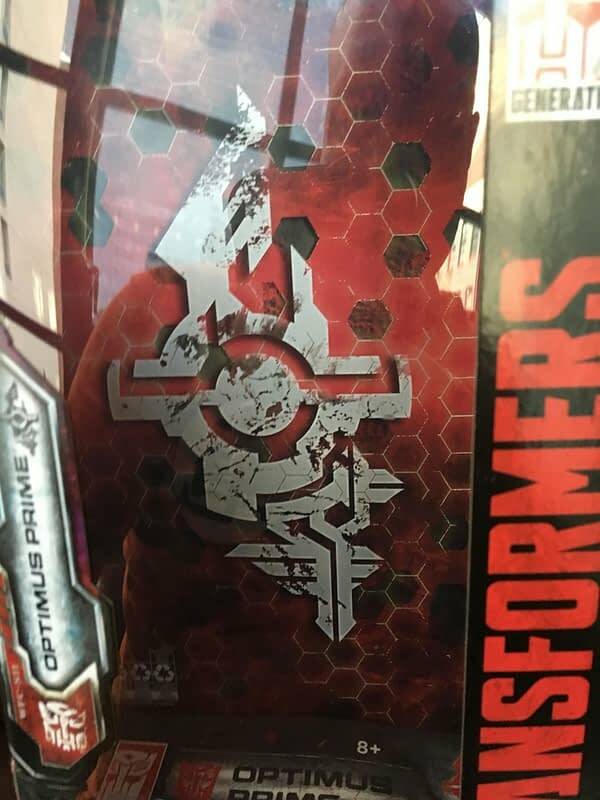 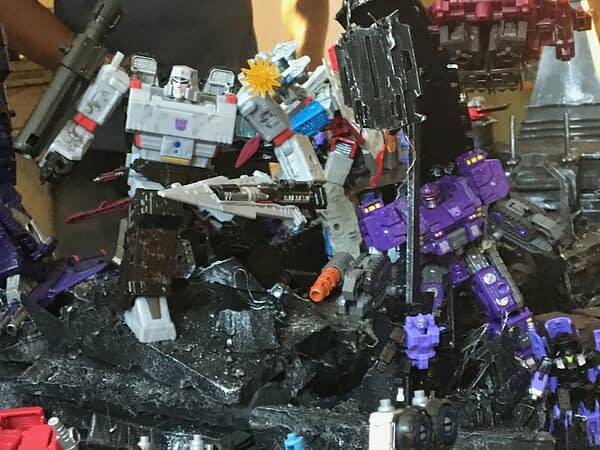 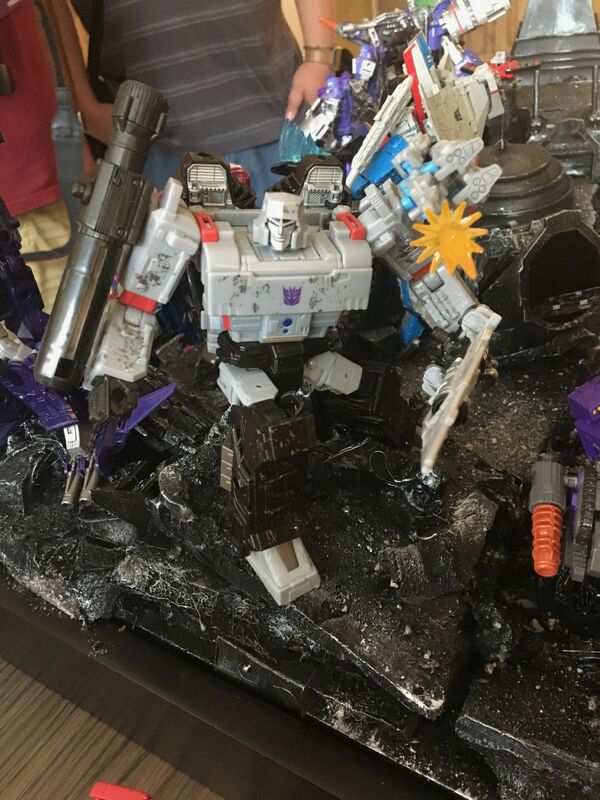 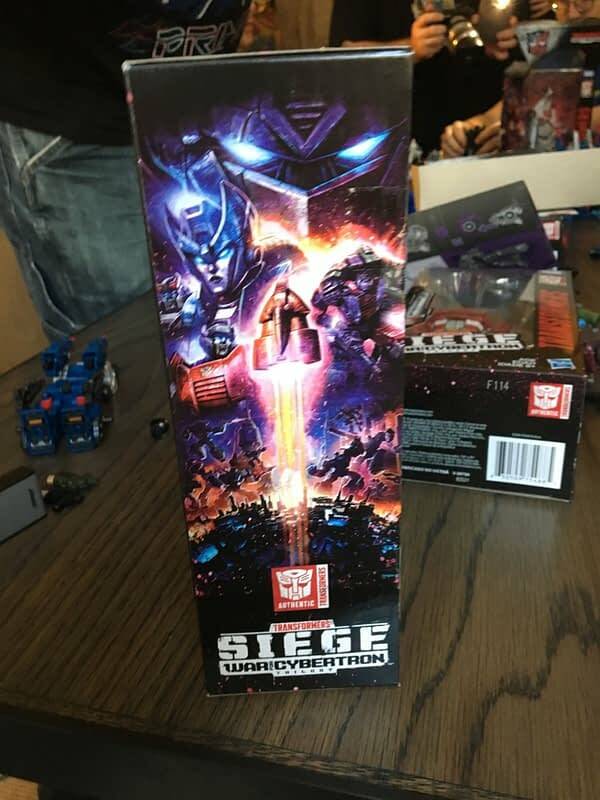 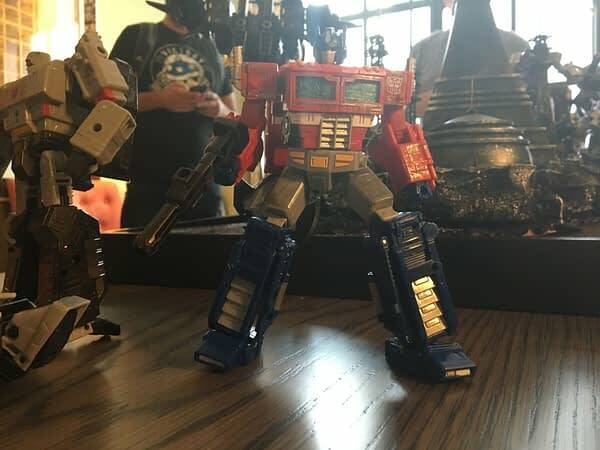 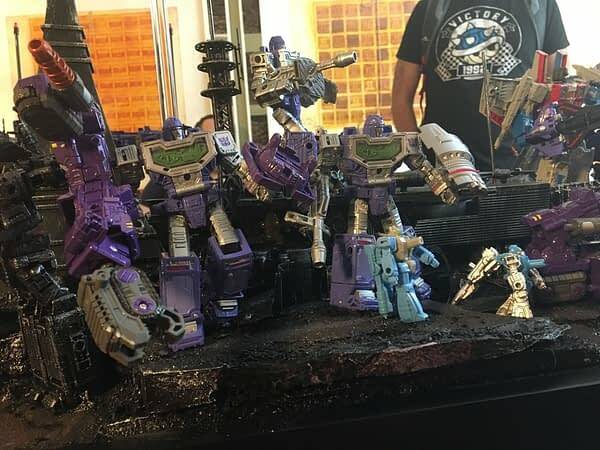 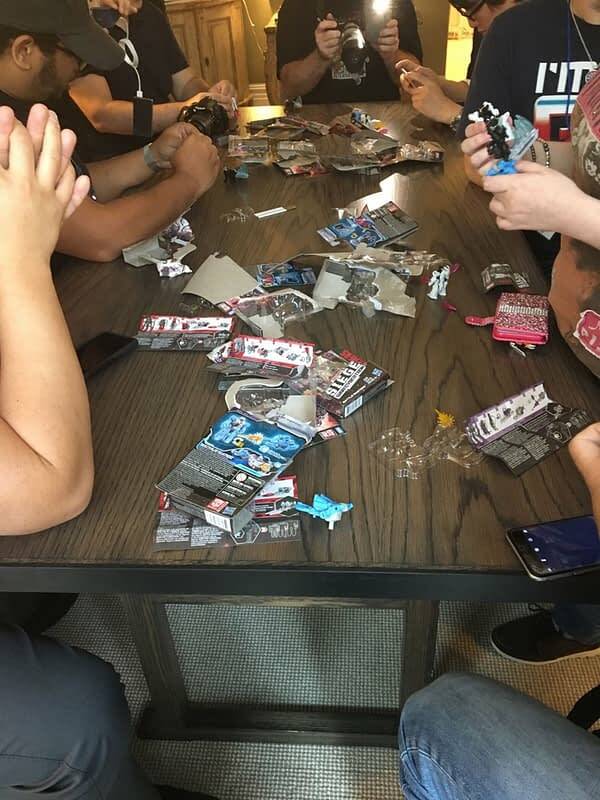 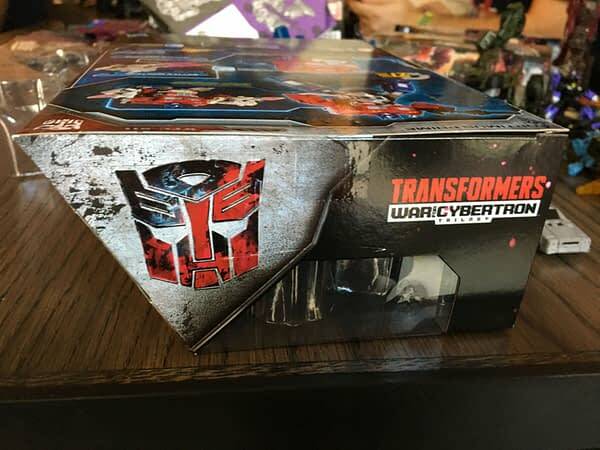 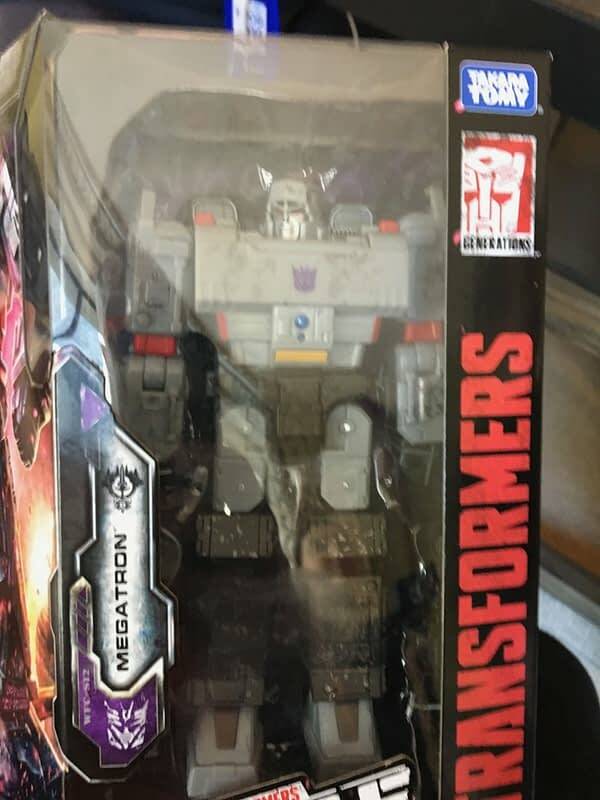 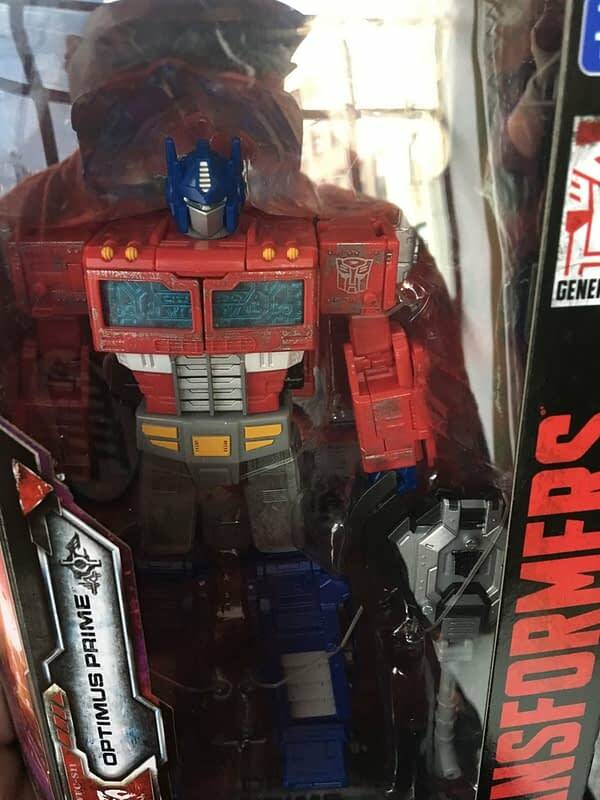 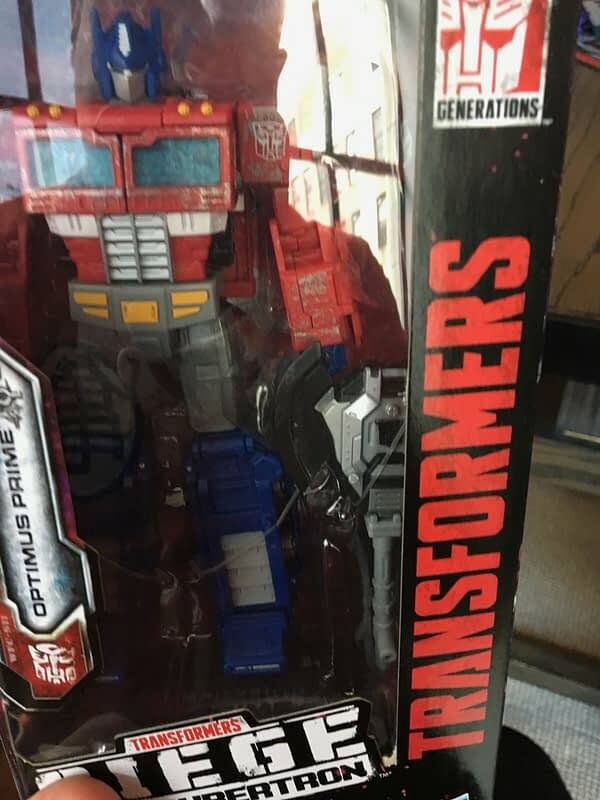 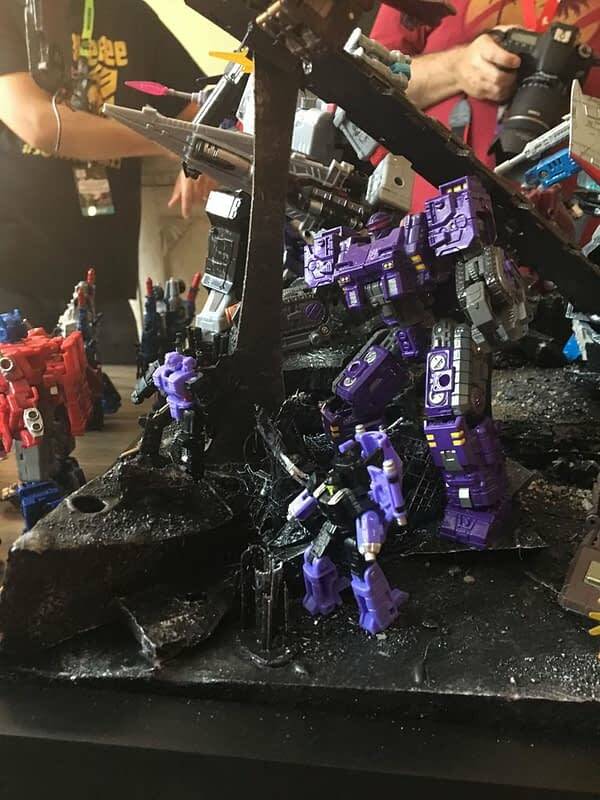 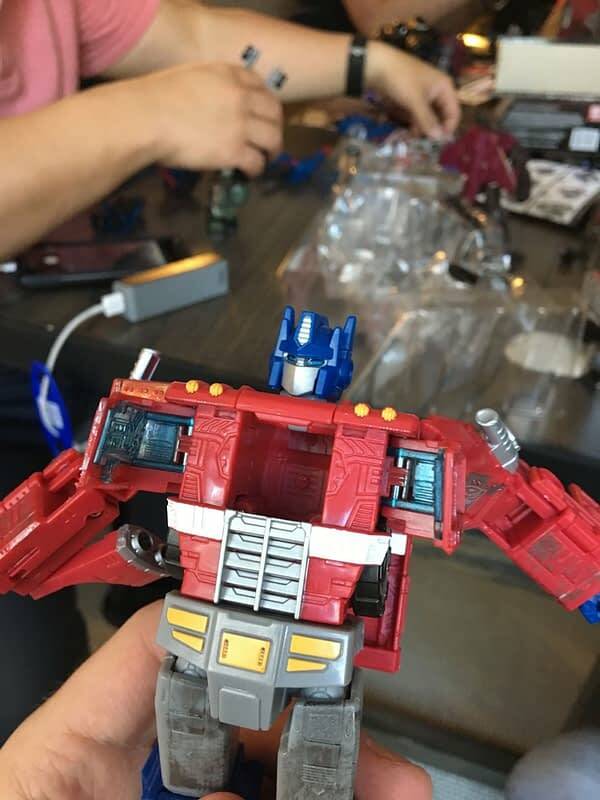 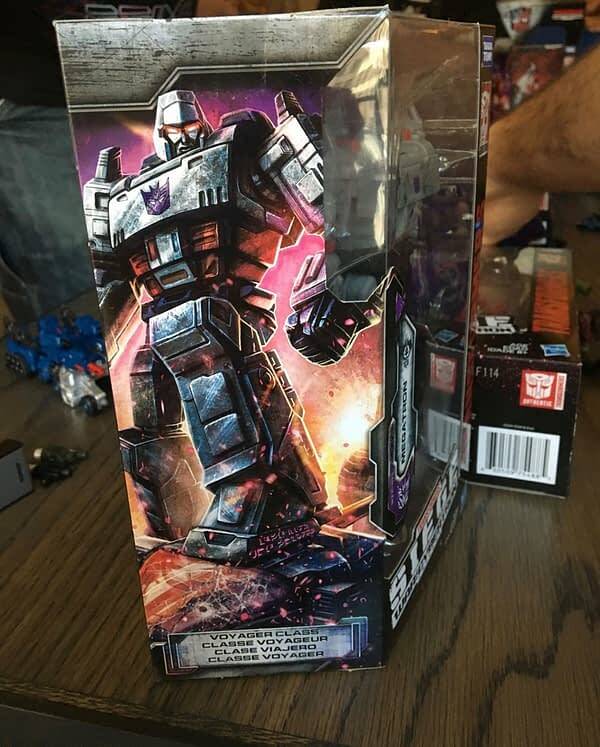 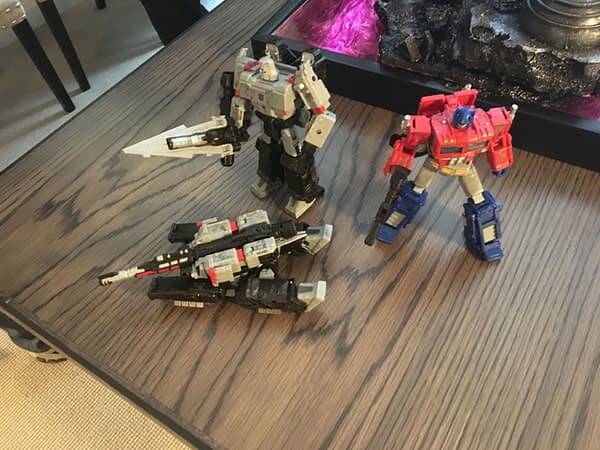 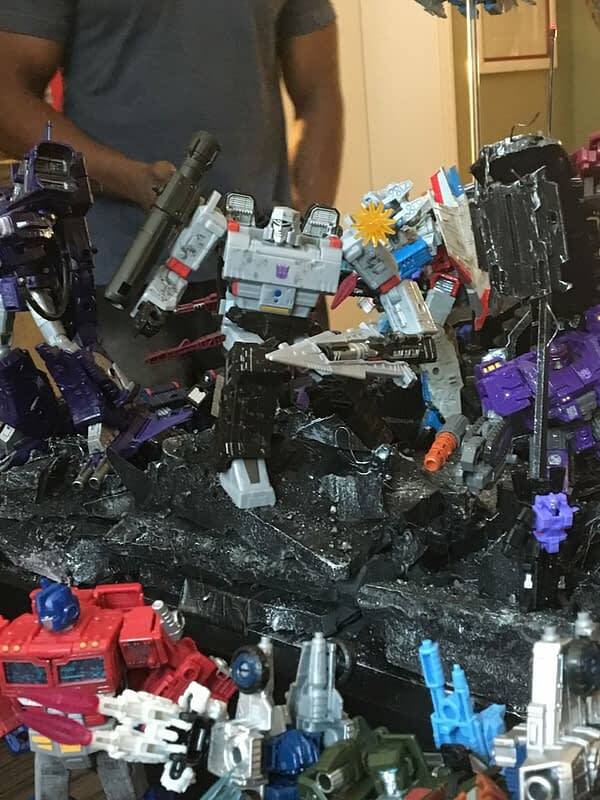 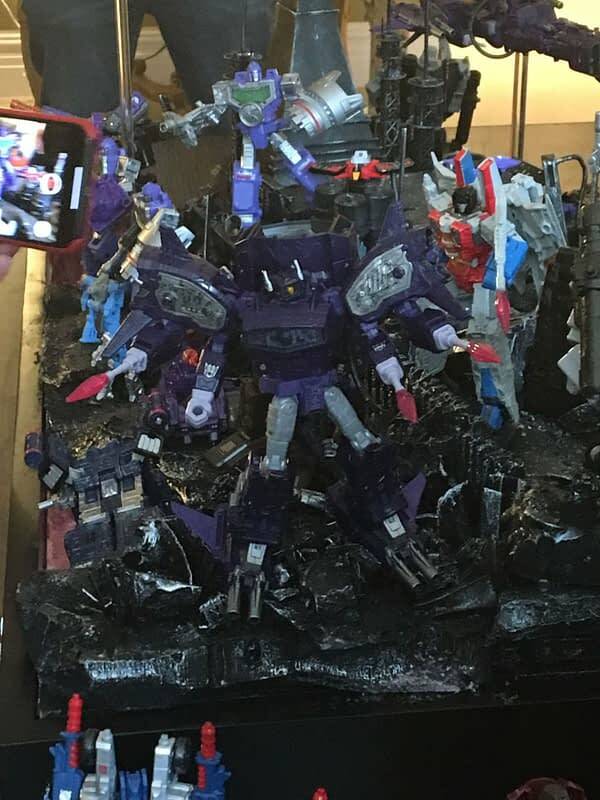 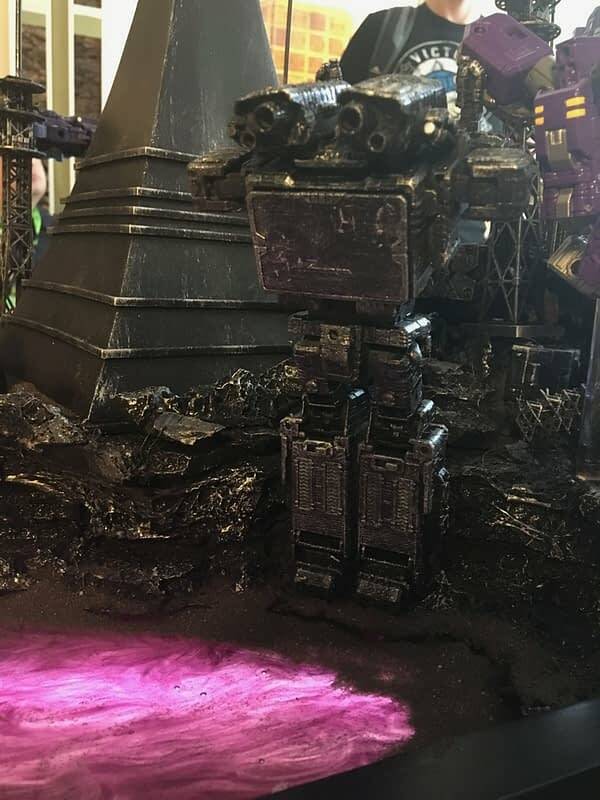 Before New York Comic-Con even began for 2018, Bleeding Cool was onsite with the team from Hasbro to unbox the new line of Siege of Cybertron figures from the Transformers. 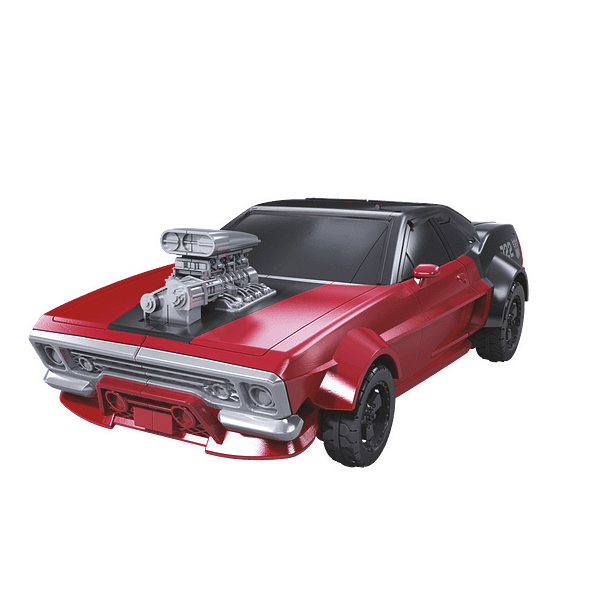 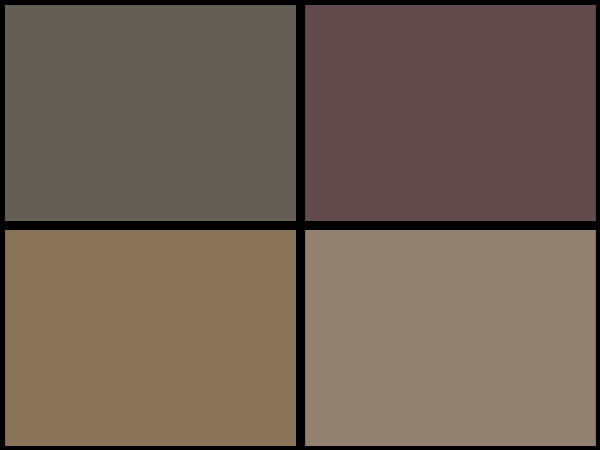 We transformed a wide assortment of offerings and spoke with them about what fans can expect from the line. 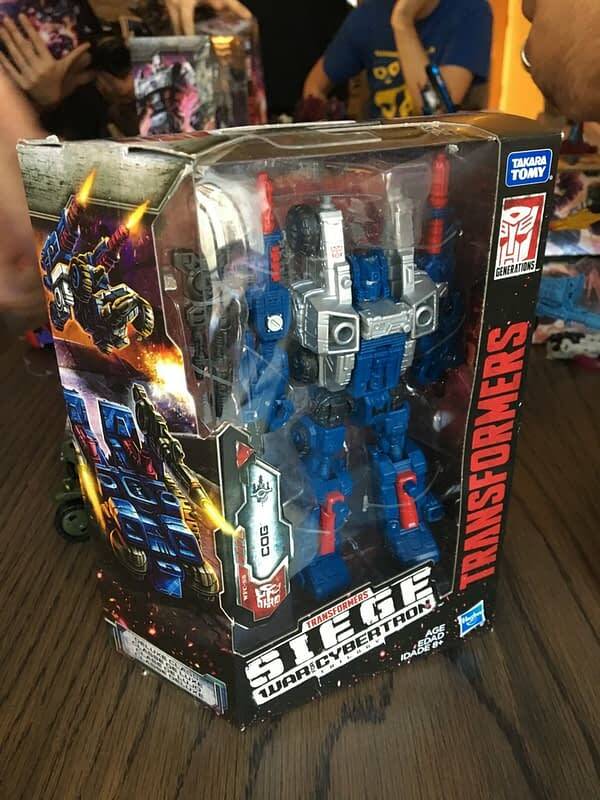 Siege is a sub-line within the Generations category and the first part of the War for Cybertron Trilogy. 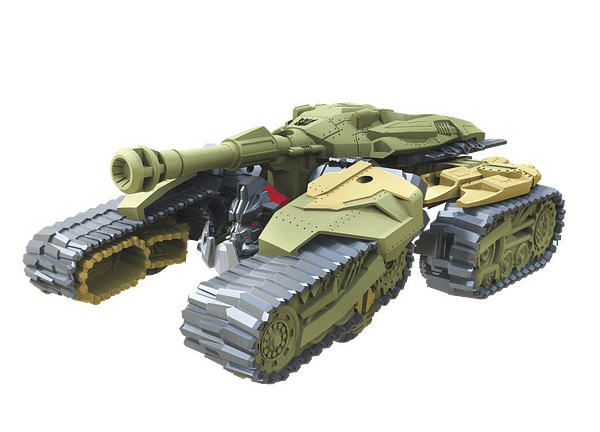 Its focus is on playability and action-scene building. 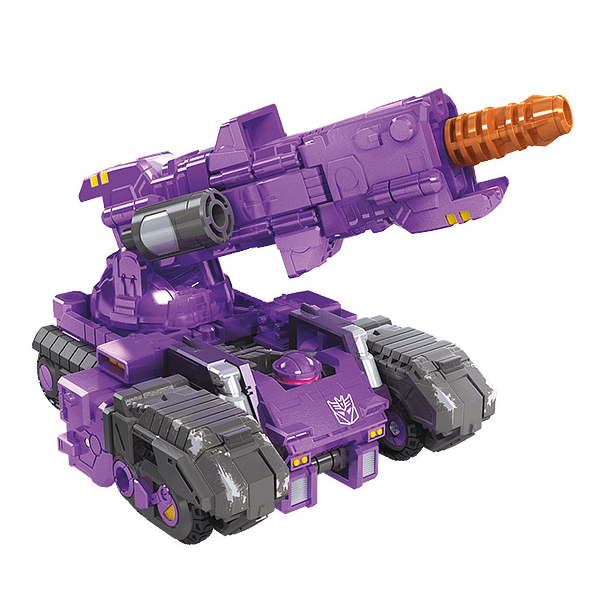 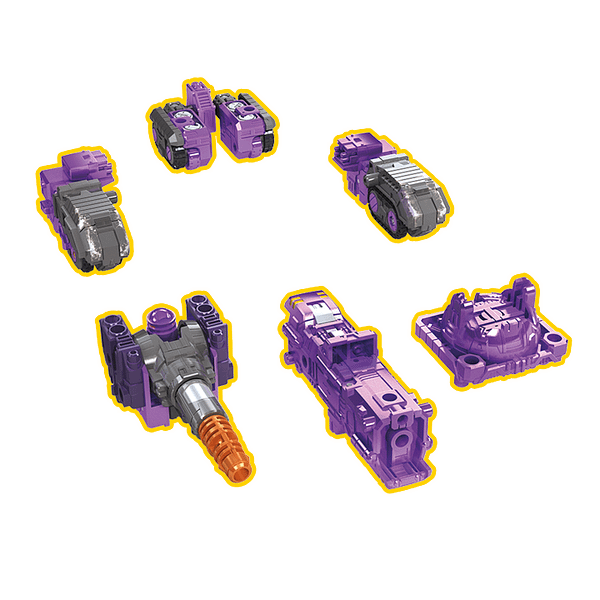 This is accomplished through the use of Battle Masters which are weapon-based mini-cons that can be transformed on their own and combined with the larger toys in a variety of ways. 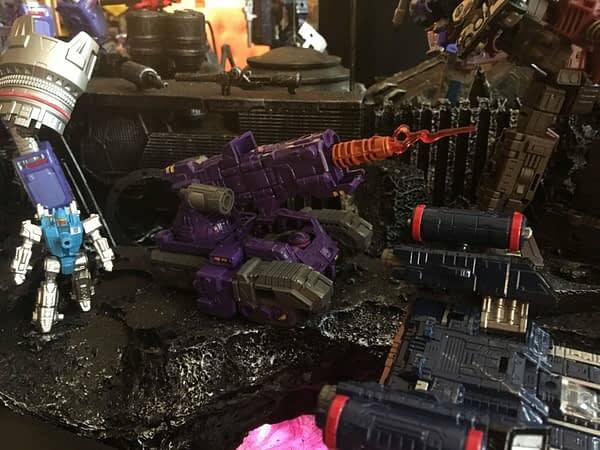 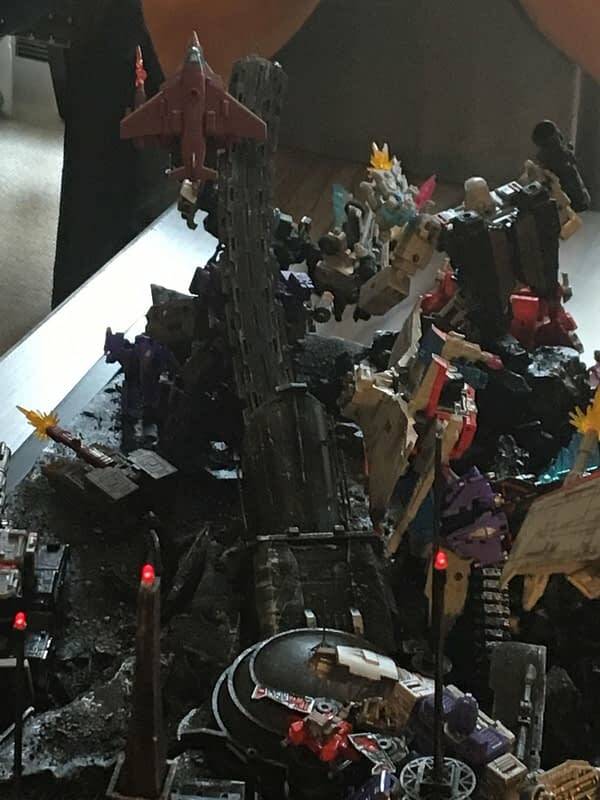 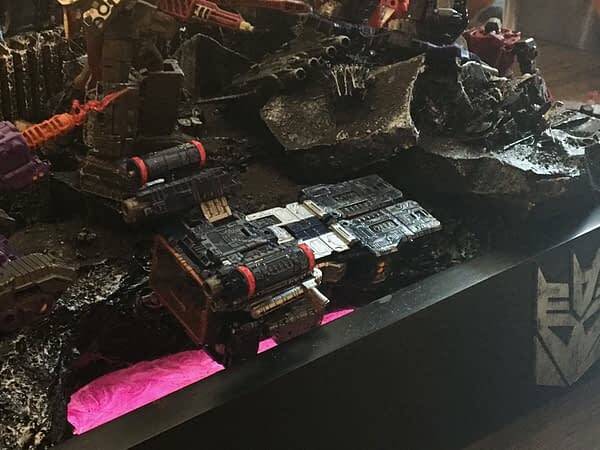 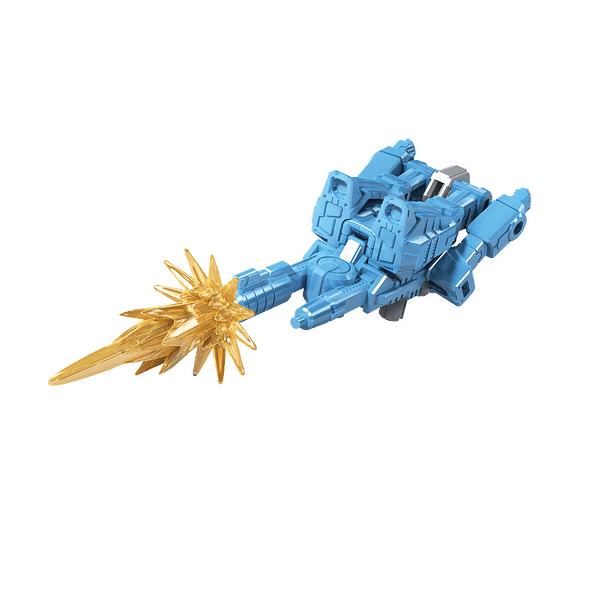 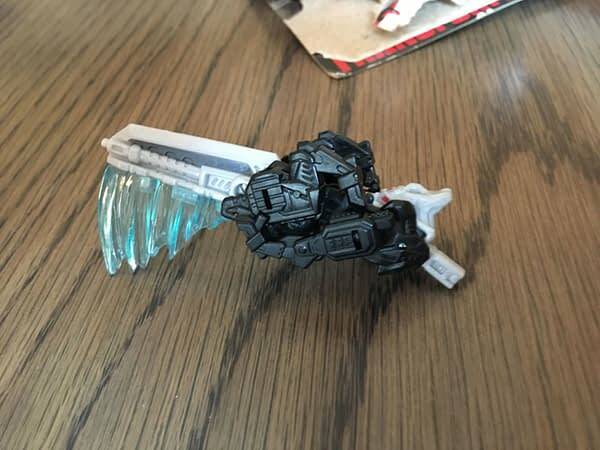 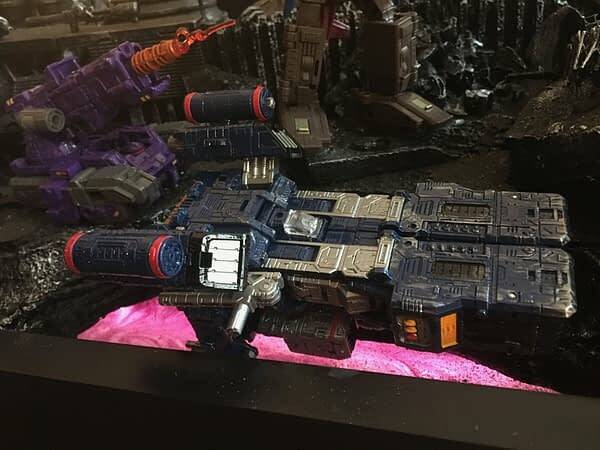 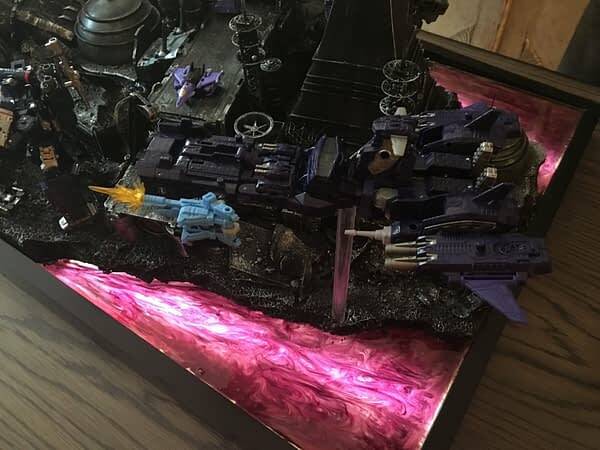 Blast effects are prevalent with the hope that the last days of the Autobots and Decepticons war on their home planet of Cybertron can be displayed in whatever way the fans desire. 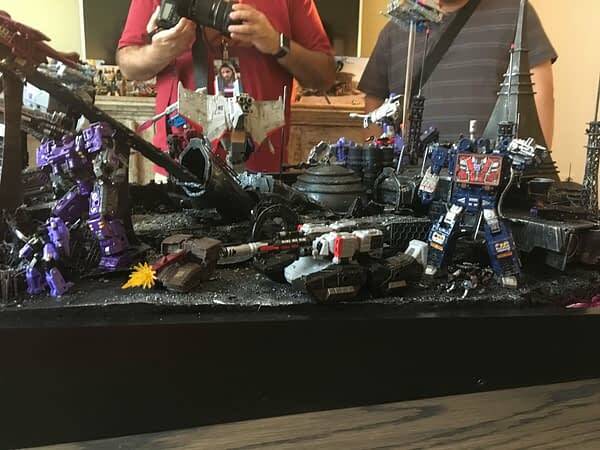 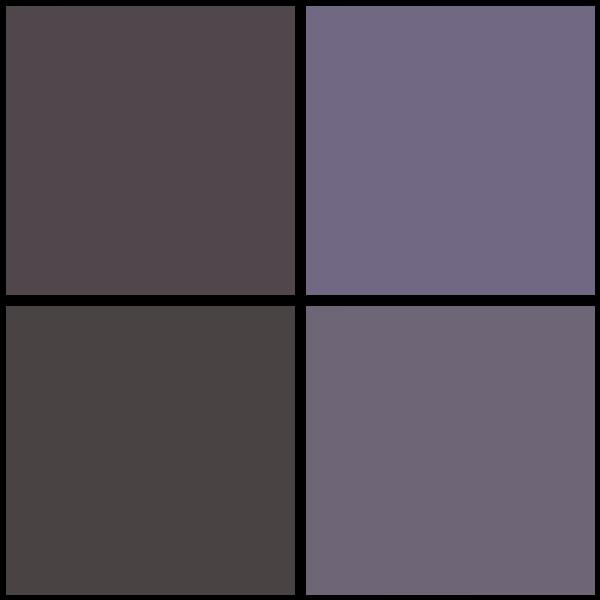 The feeding frenzy began as the team introduced the Battle Masters Firedrive, Lionizer, and Blowpipe. 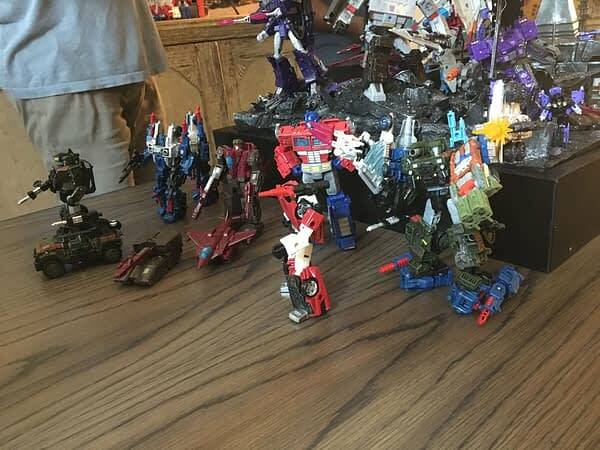 Each has an alt-mode and a weapon mode. 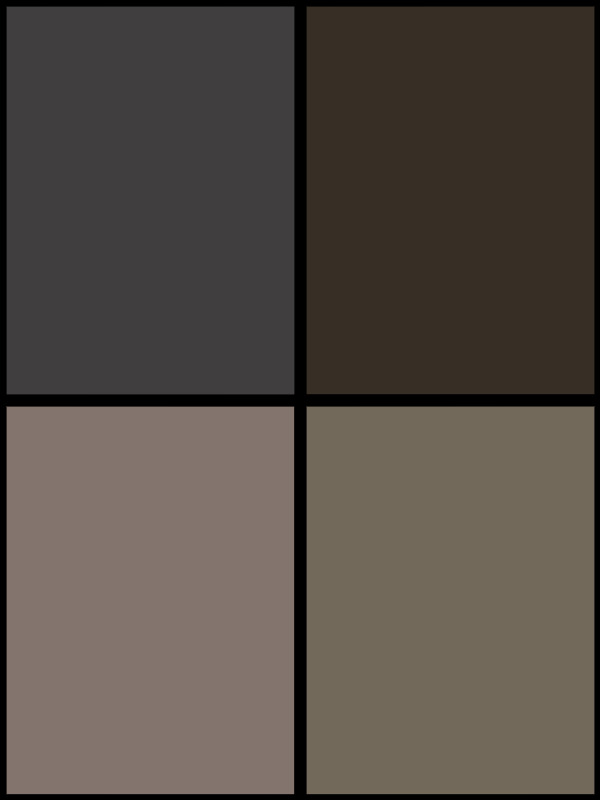 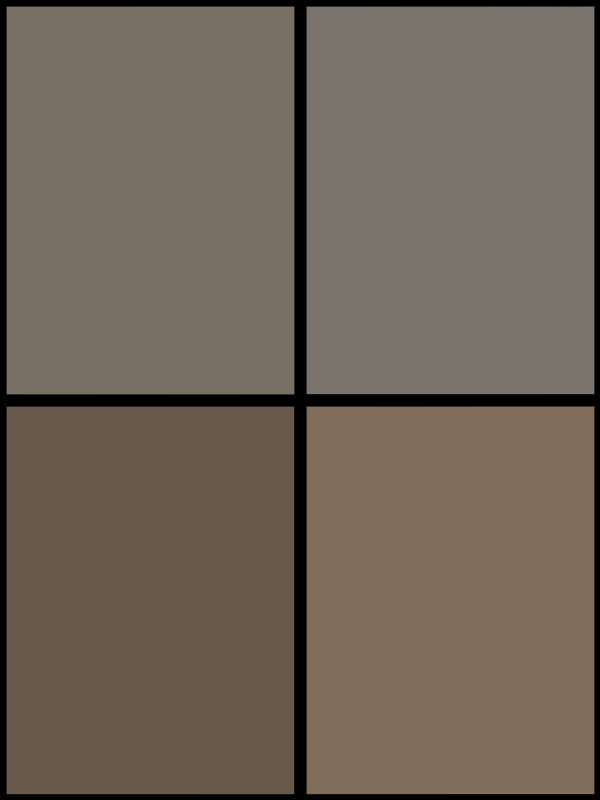 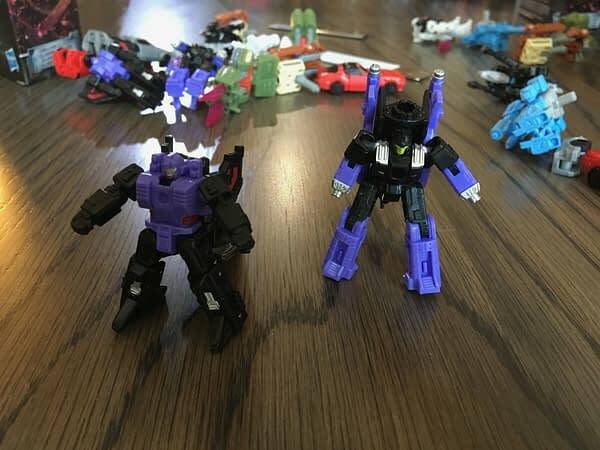 They can be used with any of the larger figures in the series. 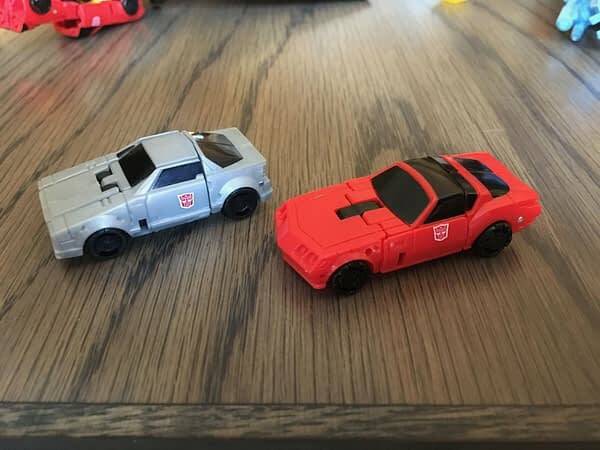 These were followed by the Micro Masters, all of which were new versions of the classic G1 characters and designs. 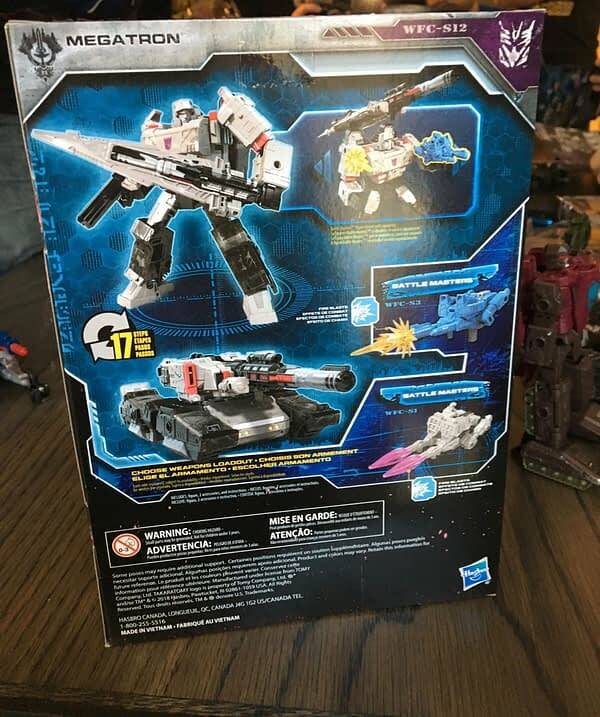 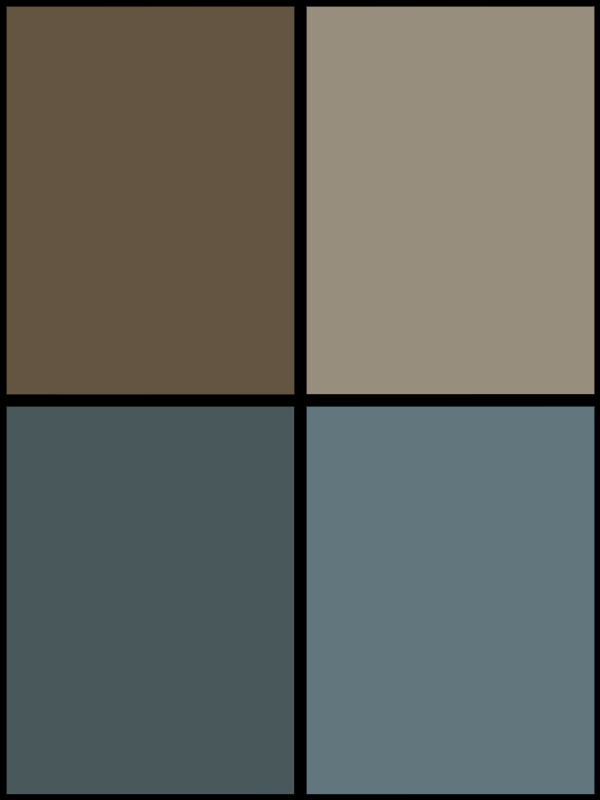 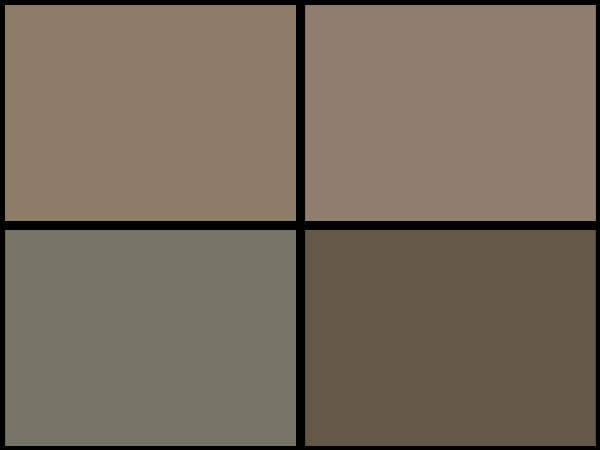 Wave 1 includes Roadhandler and Swindler (Race Car Patrol), Storm Cloud and Visper (Air Strike Patrol), and Topshot and Flak (Battle Patrol). 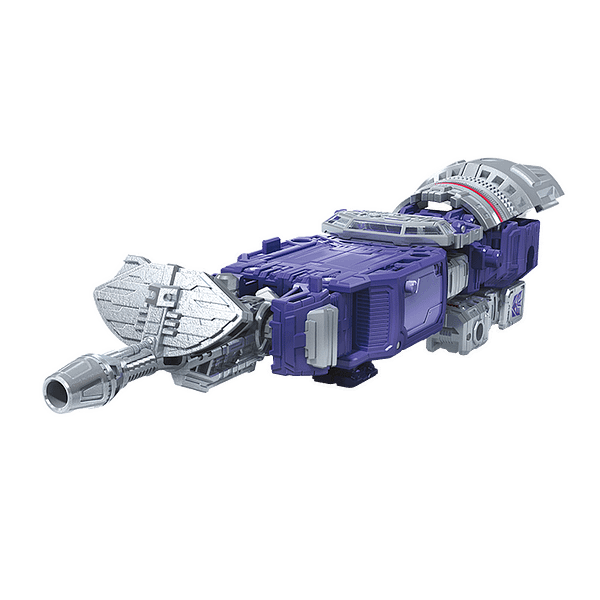 These have standard robot modes and alt-modes as well as the ability to be combined together to make larger weapons to be used by others in the line. 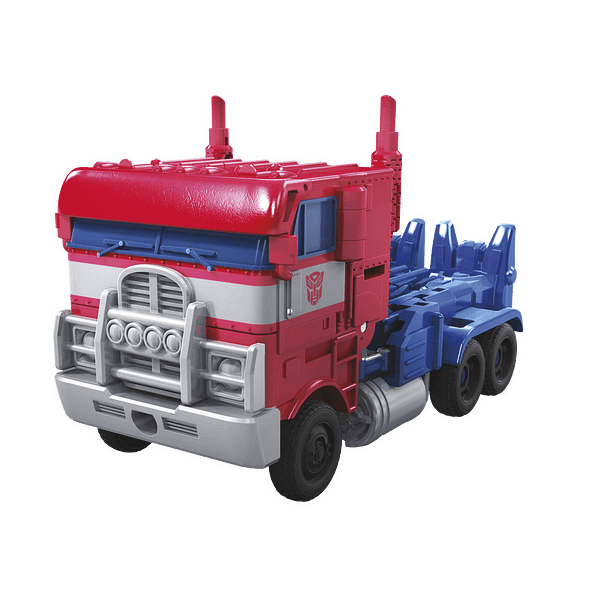 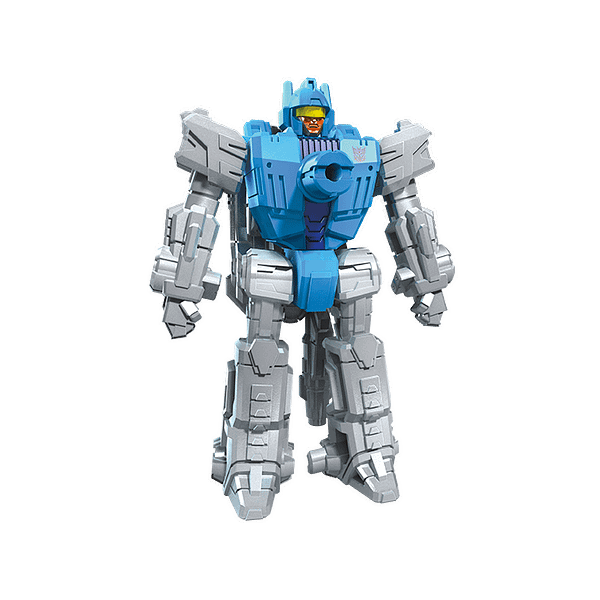 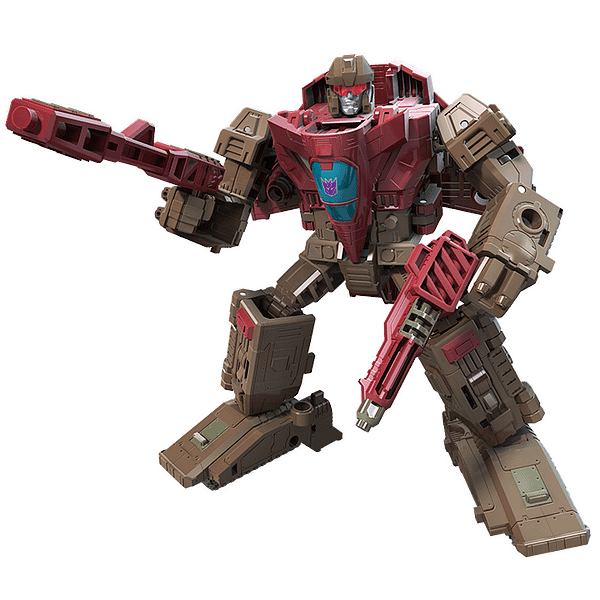 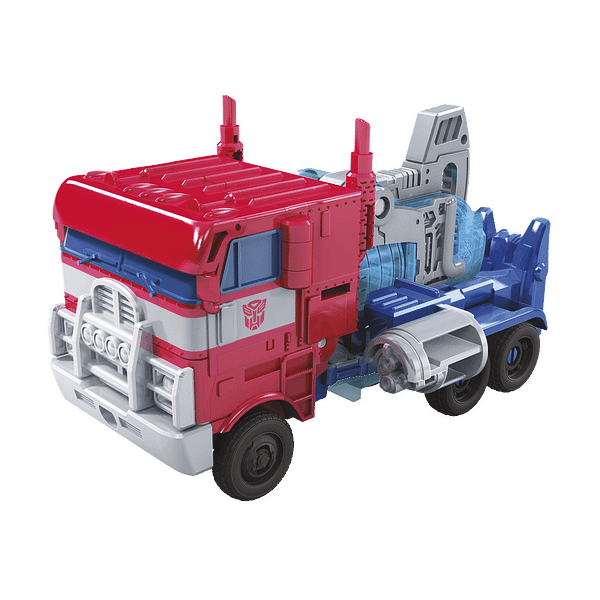 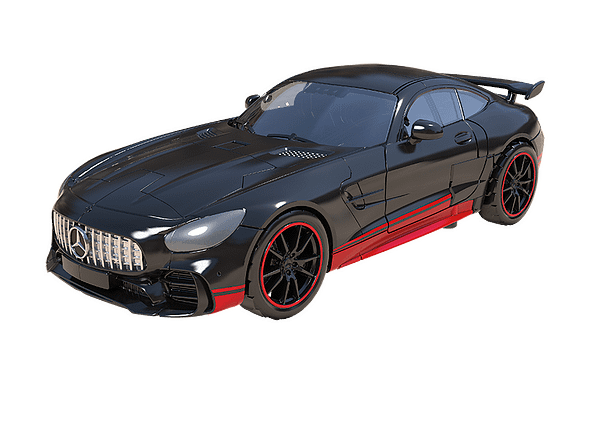 Deluxe Class includes Sideswipe, Cog, Hound, and Skytread and finally the Voyager Class includes Optimus Prime and Megatron. 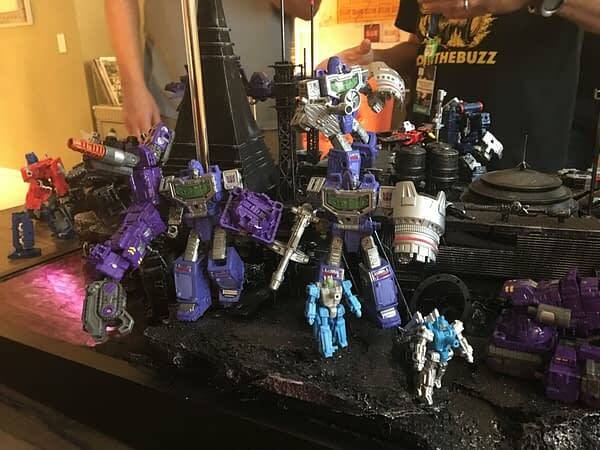 These are the figures that will round out Wave 1. 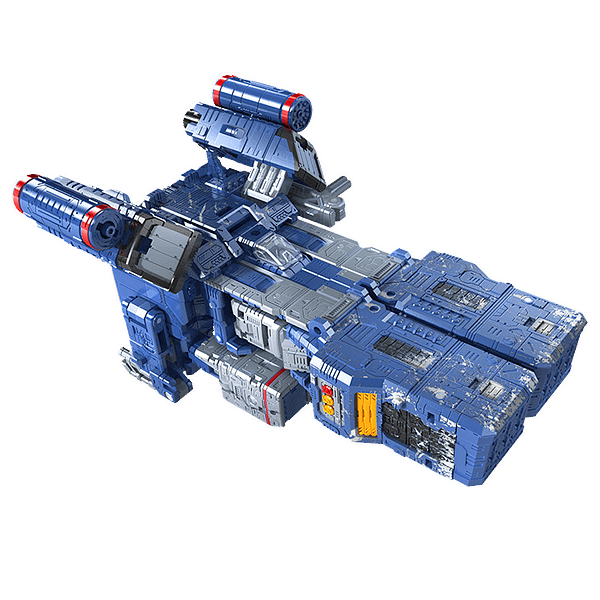 Cog, a surprise to most, is a full-sized version of the mini-con that once came with the G1 Fortress Maximus. 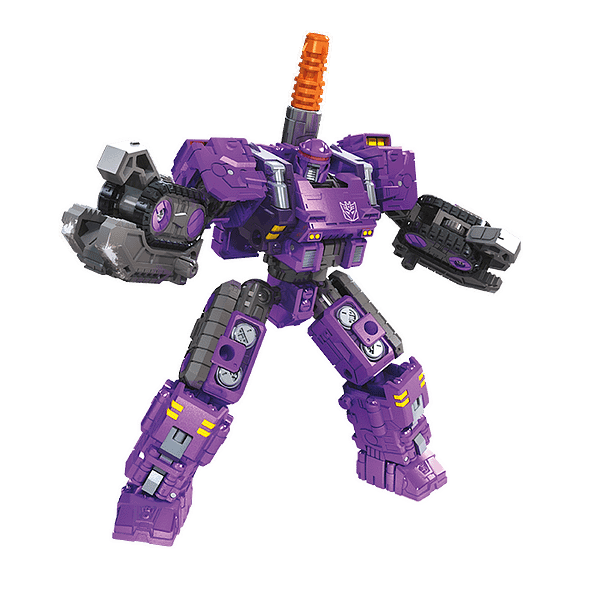 He is included here as a Weaponizer figure meaning that he can be disassembled and used as weapons and equipment for the other figures. 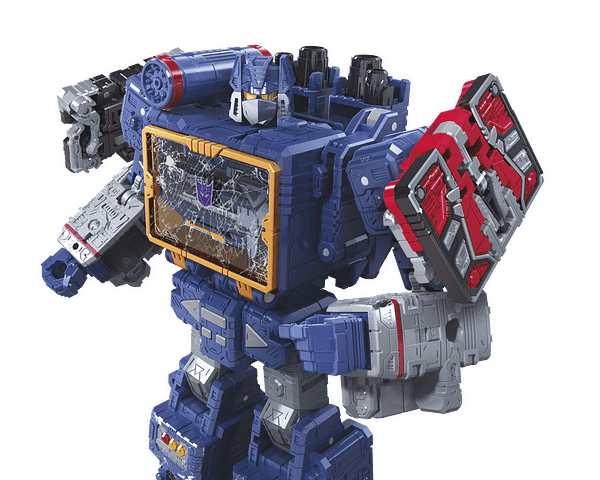 Optimus Prime’s chest opens, showing how he normally fits the Matrix of Leadership in there though one is not included. 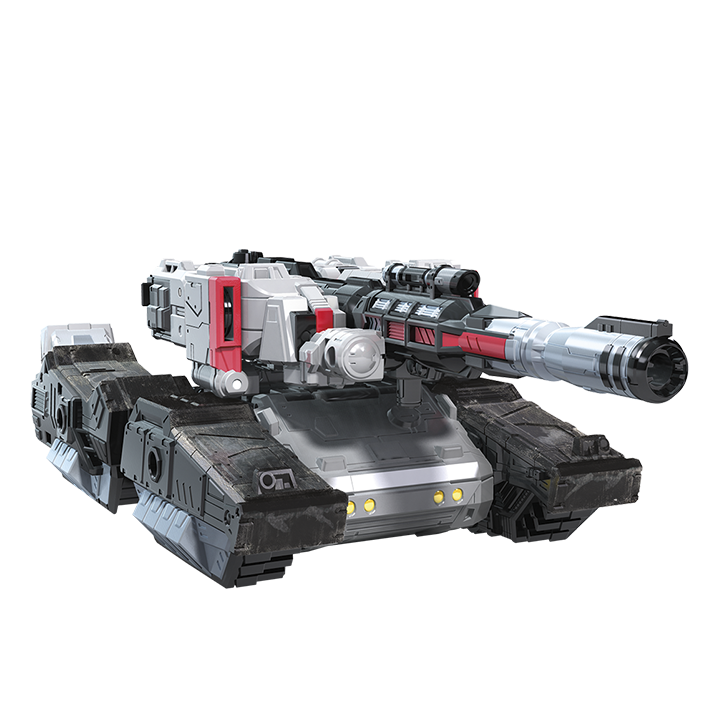 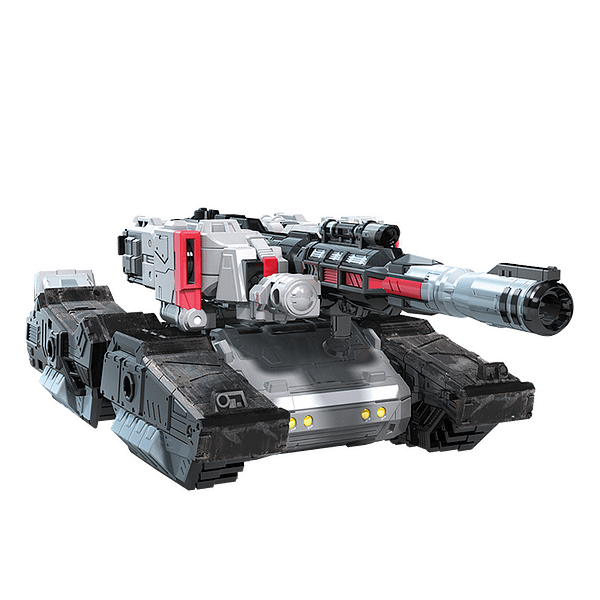 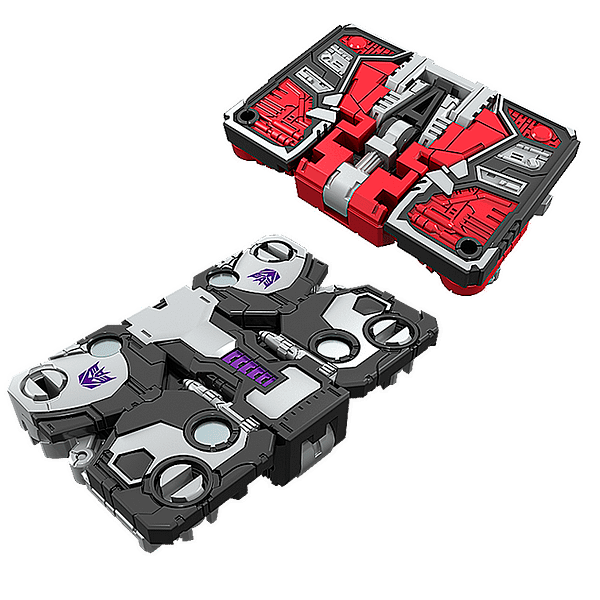 This time around Megatron’s alt-mode is a tank. 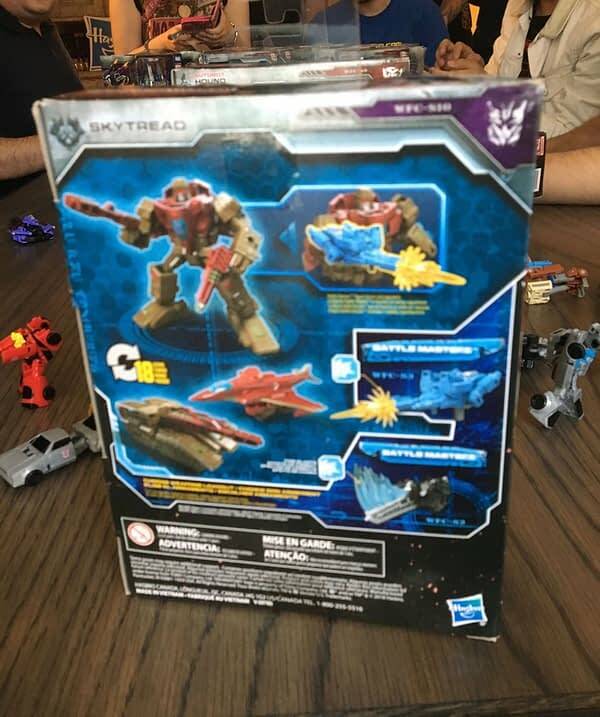 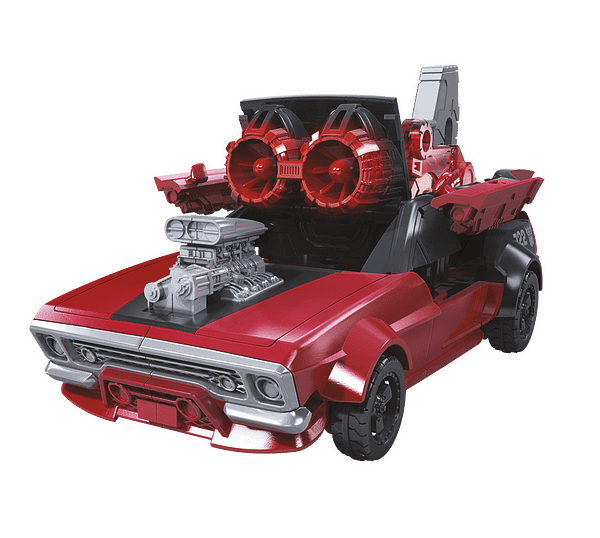 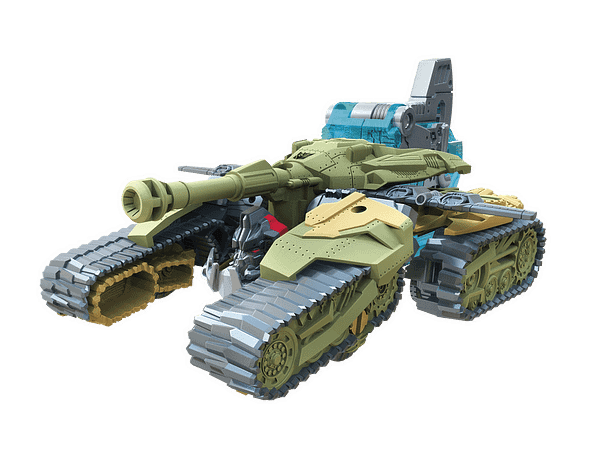 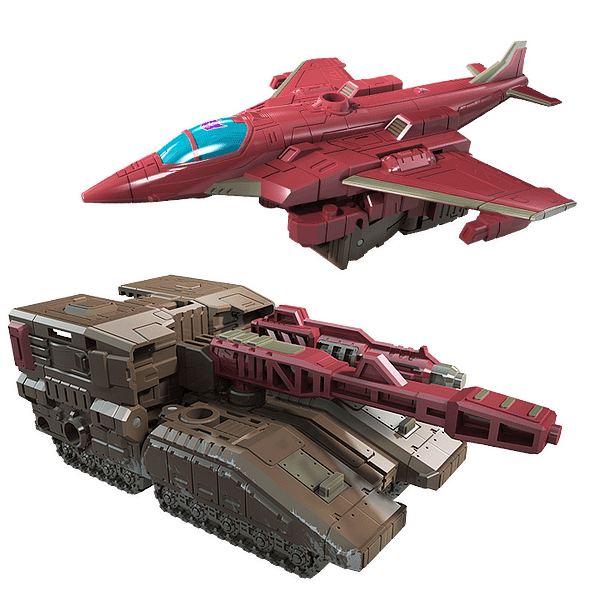 When asked how the characters could have Earth based alt-modes when they had not yet left their home world the team remarked that though they were going for a military feel with the story and setting they wanted to keep the designs classic to what fans knew and felt that it would be limiting to just have all alt-modes be based on the ‘space vehicles’ seen sporadically throughout the franchise. 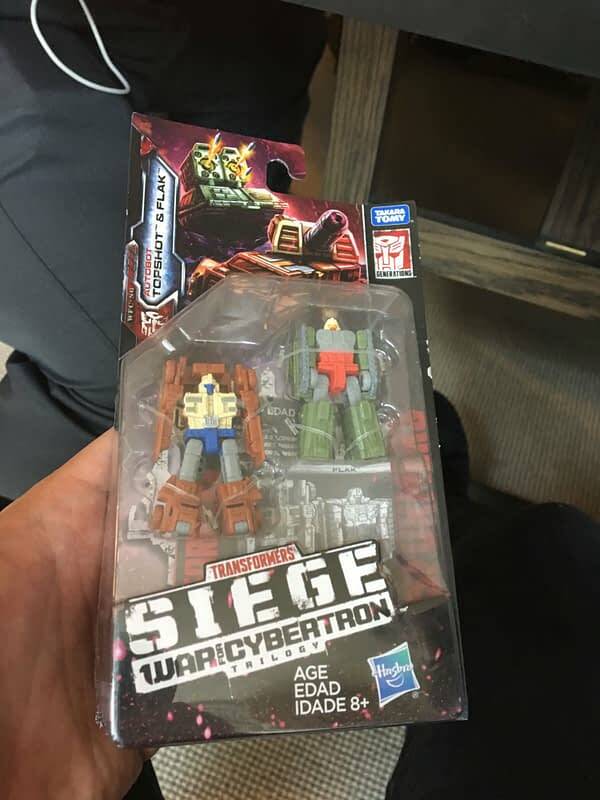 As Siege covers the origins of the war on Cybertron, long before its combatants reached Earth, the line focuses on all elements of war. 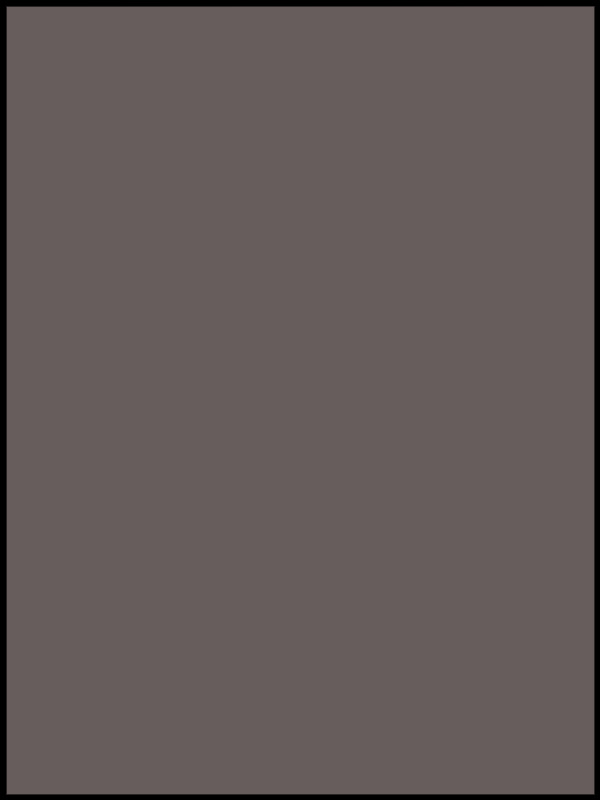 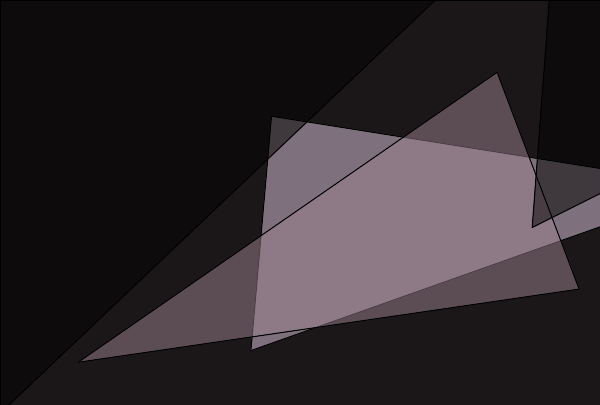 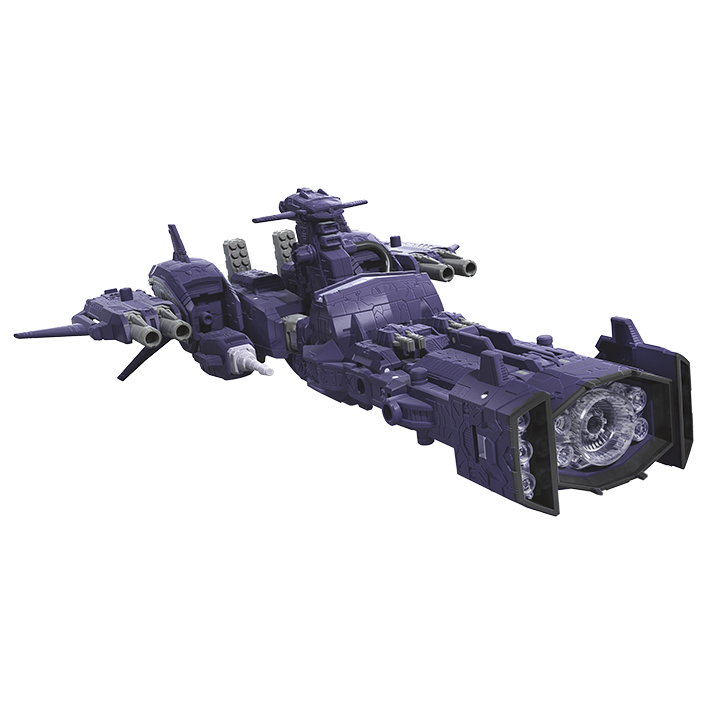 Not only weapons and armaments but spycraft and logistics. 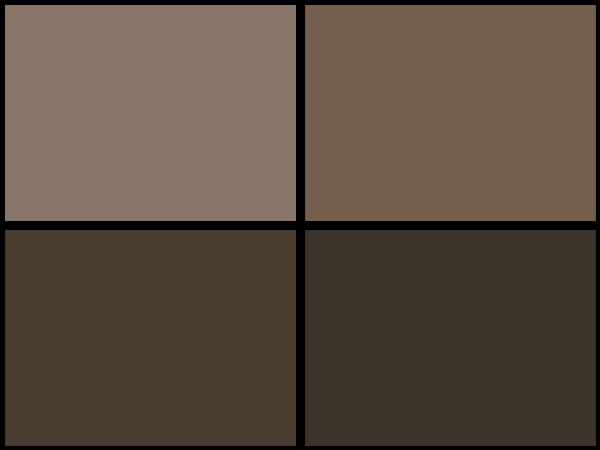 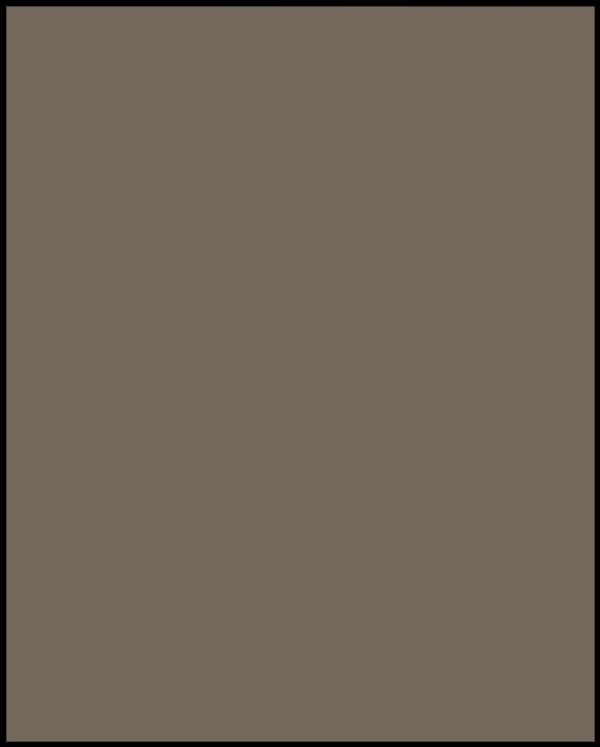 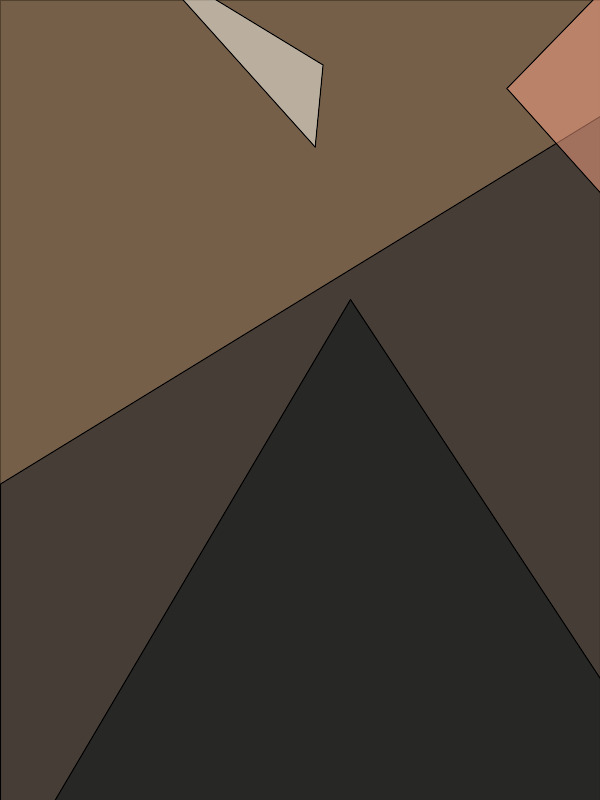 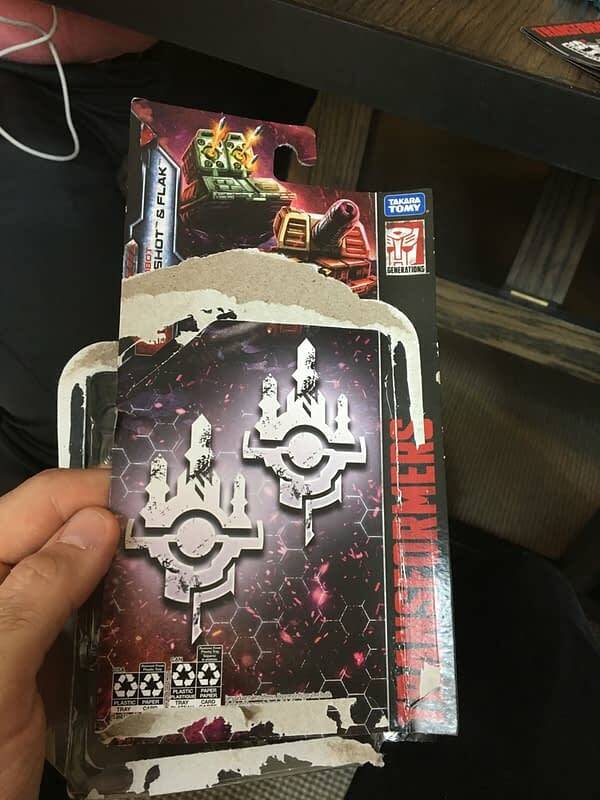 The actual packaging of the line includes specific insignias that would be the equivalent of the characters’ military rank in-story. 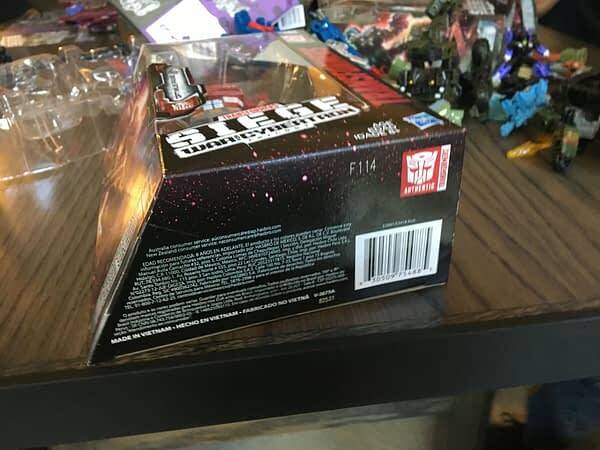 The packaging includes hidden messages when parts of it are exposed to sunlight, giving fans one more reason to not discard it after the toy is opened. 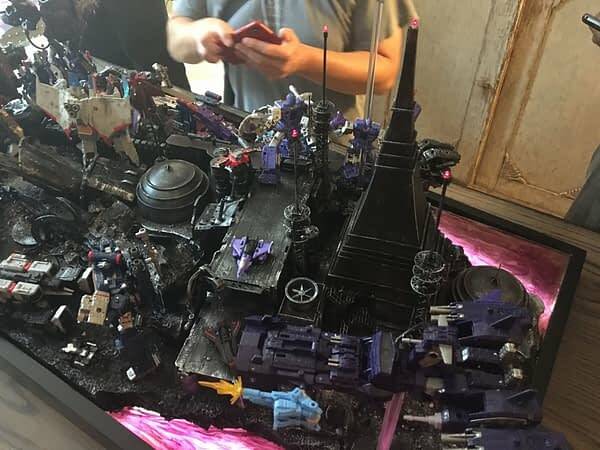 More of this was on display later in the day when the team unveiled its Siege-based diorama. 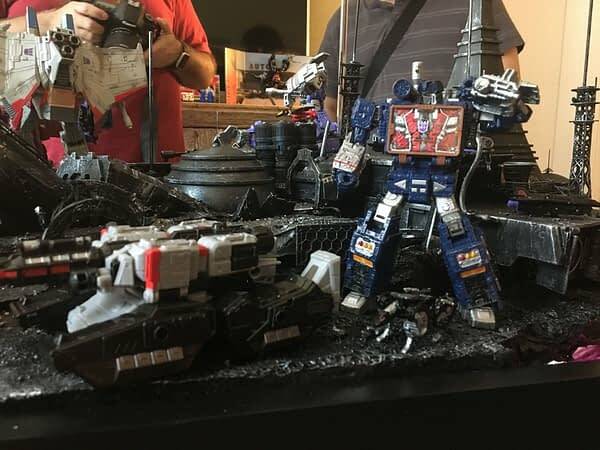 This showed the type of battle scenes that they are hoping will inspire fans to build on their own. 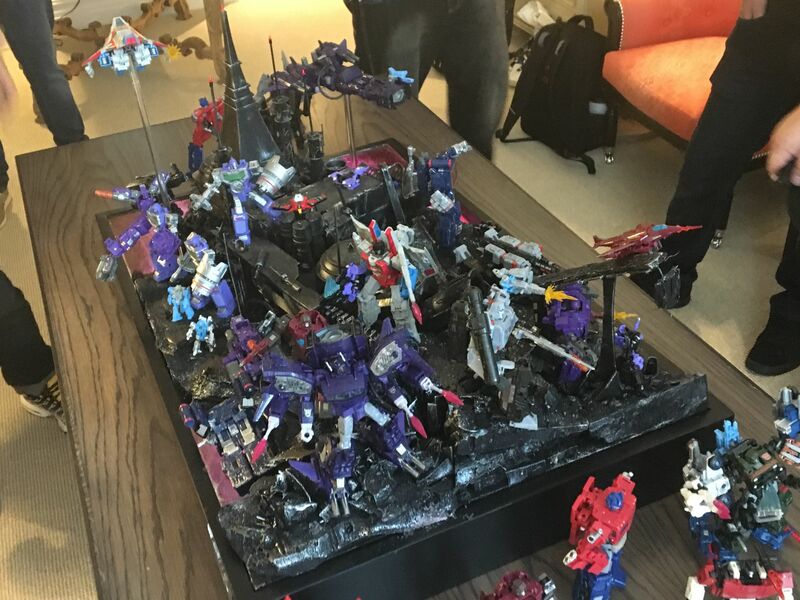 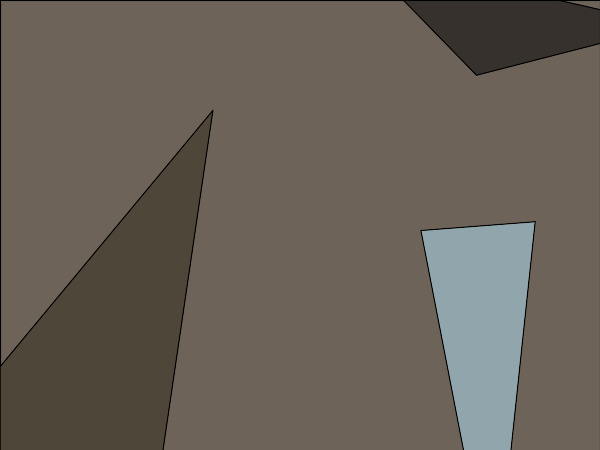 This included rivers of liquid Energon and the remnants of Guardian Robots turned into debris. 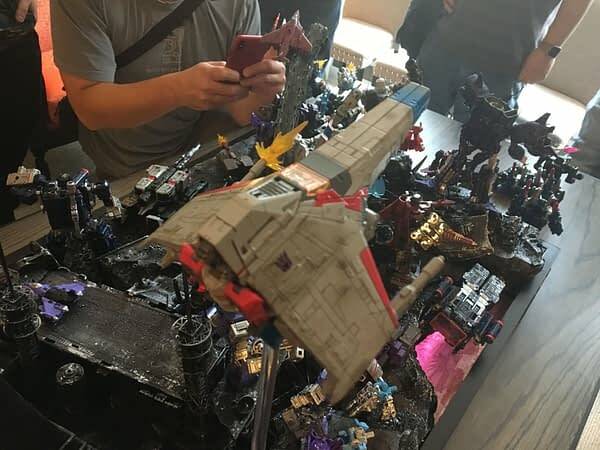 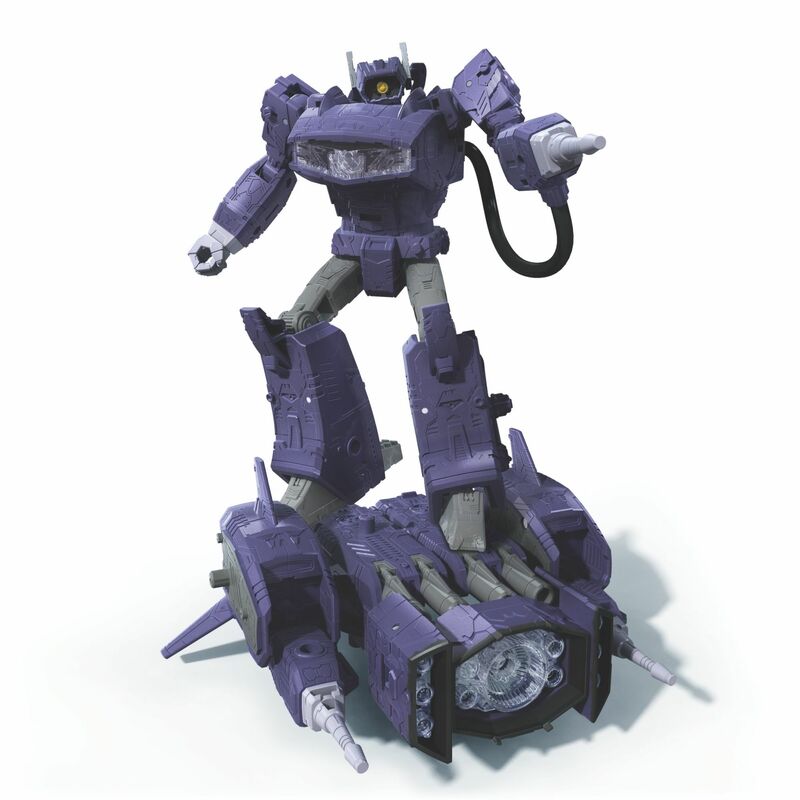 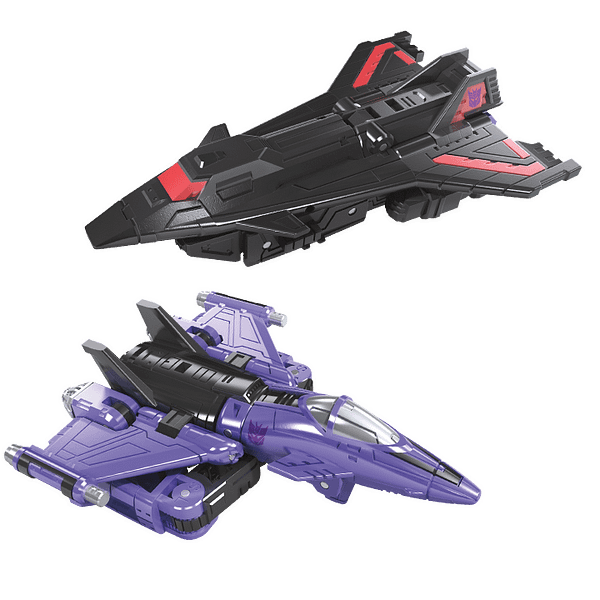 Figures not unboxed, including Starscream, Soundwave, and Shockwave, sported more ‘space based’ alt-modes including the former cassette player as a starship. 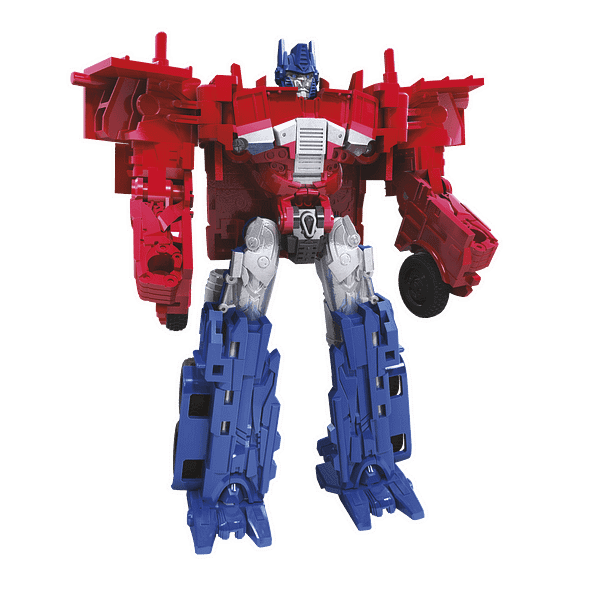 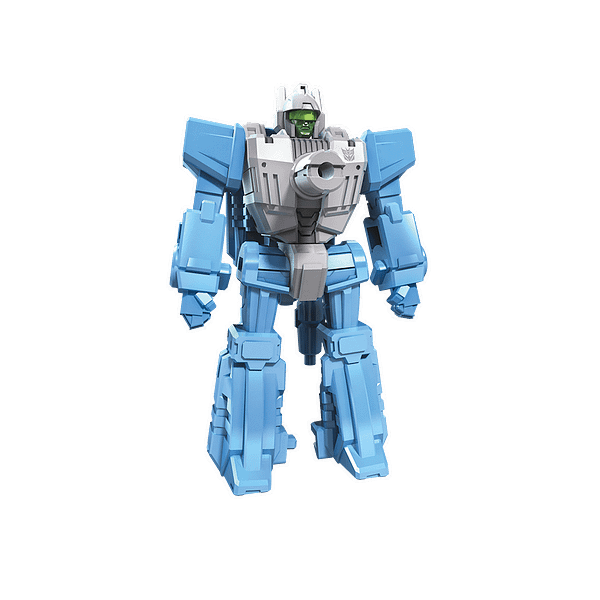 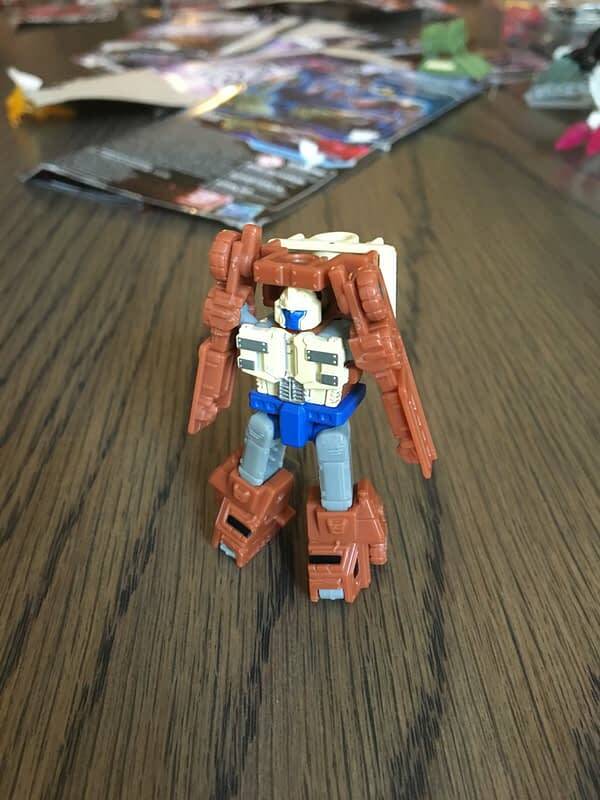 His figure, which will be released as part of a later Wave, can automatically jettison his mini-cons. 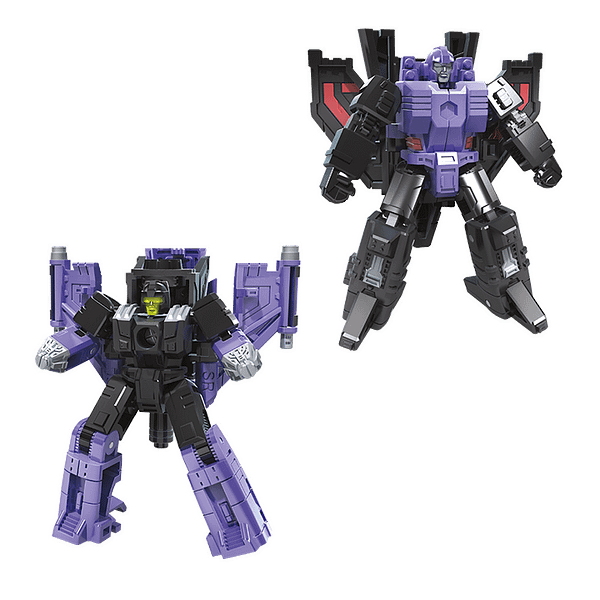 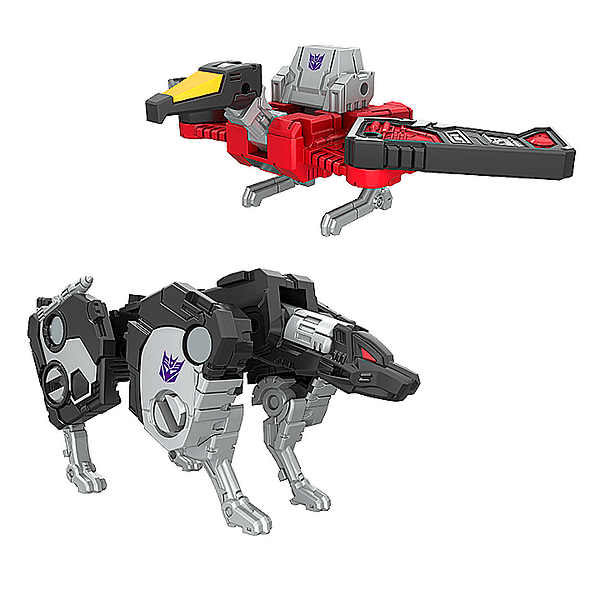 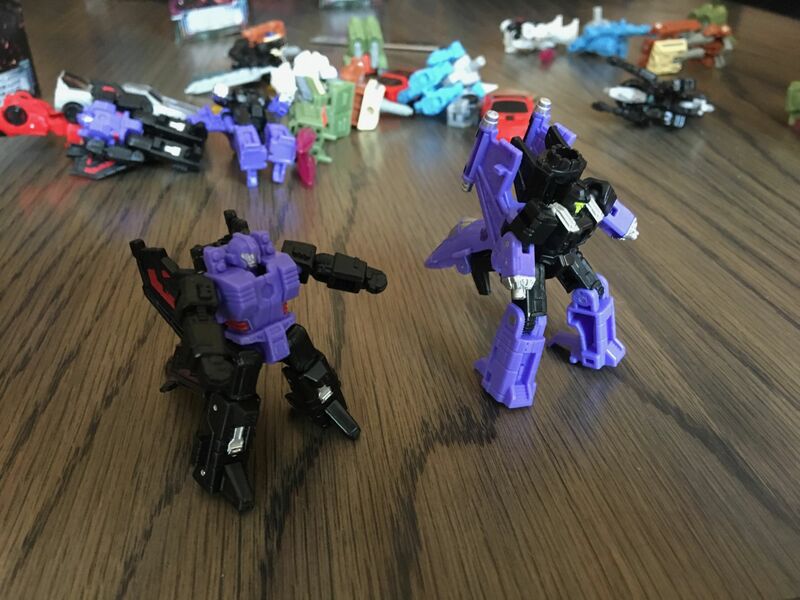 Laserbeak and Ravage will be available as a separate two-pack. 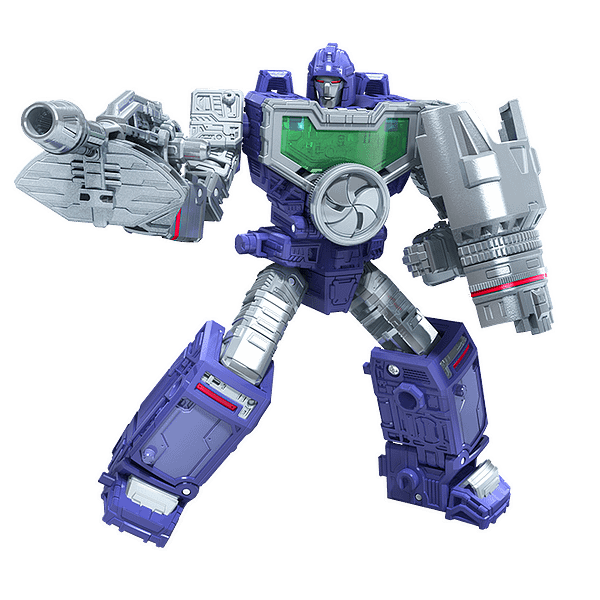 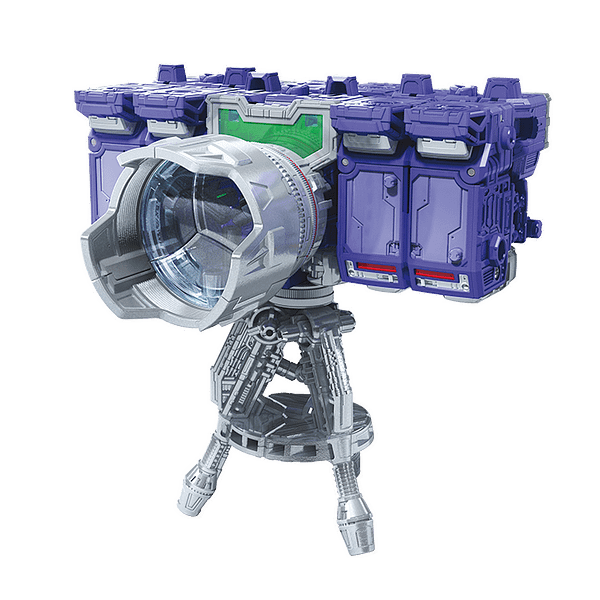 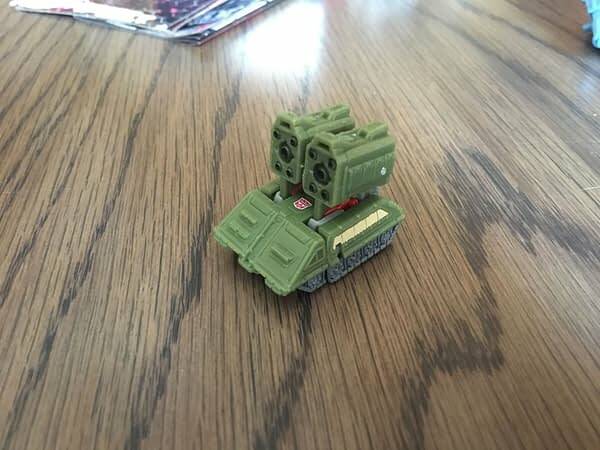 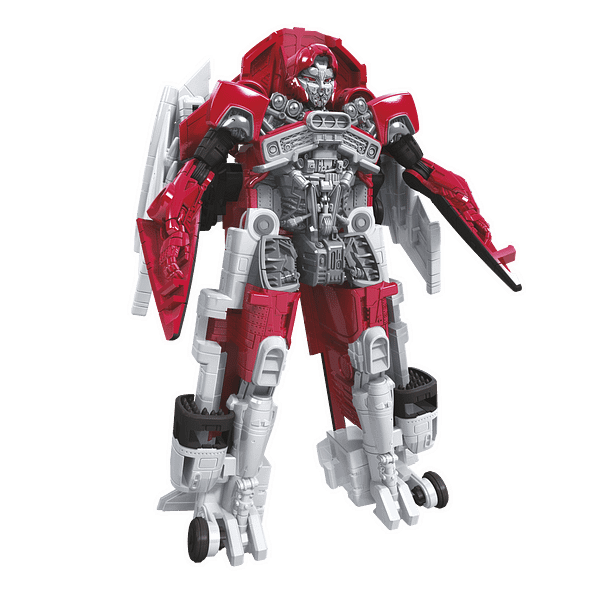 Refraktor, formerly known as the Decepticon Reflector during G1, now has a military alt-mode though purchasing three of him will allow fans to construct his classic camera mode. When asked about HasLab, Hasbro’s crowdsourced business model, being used for a Transformers product in the future the team replied that they were open for anything but that nothing was being announced at this time. 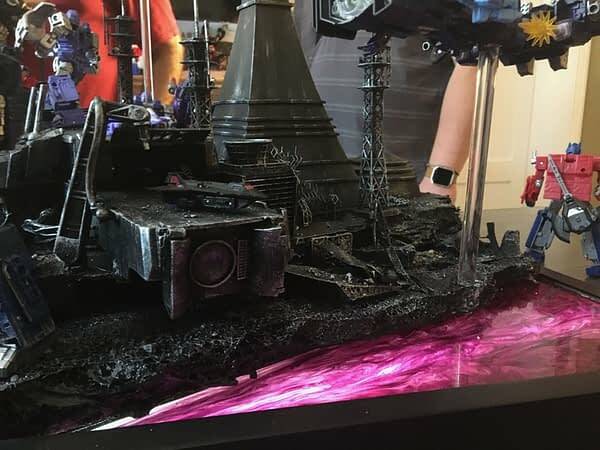 With the recent success of Jabba’s Sail Barge, from the Star Wars line, here’s hoping an Ark or Axalon is not far from being a reality. 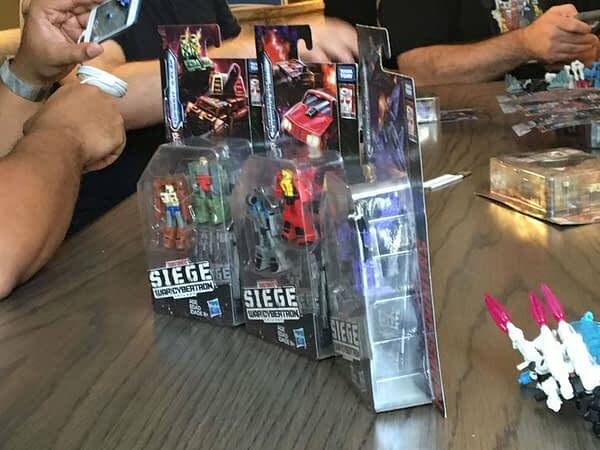 Though the Siege line currently has no tie-in cartoons or comics the team did admit that they were currently exploring potential partnerships for telling more of the story and expanding this particular view of the world at this time in the characters’ histories. 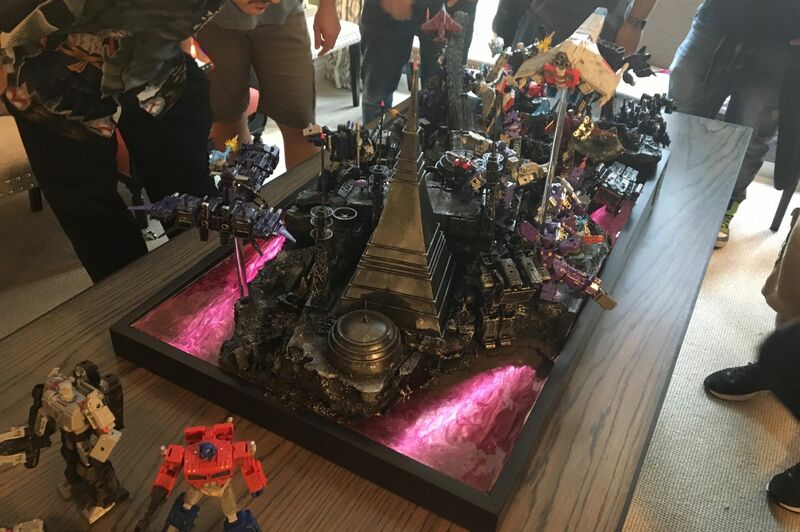 Also on display were the newest offerings from the Transformers Bumblebee line, from the upcoming film, as well as the Cyberverse line based on the new cartoon series. 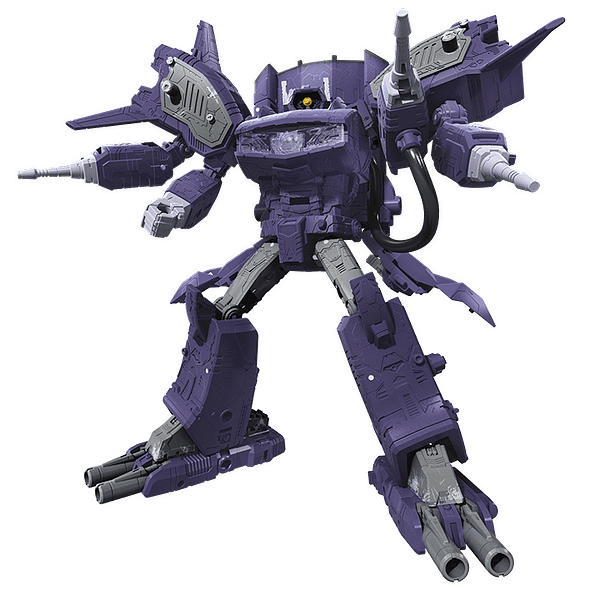 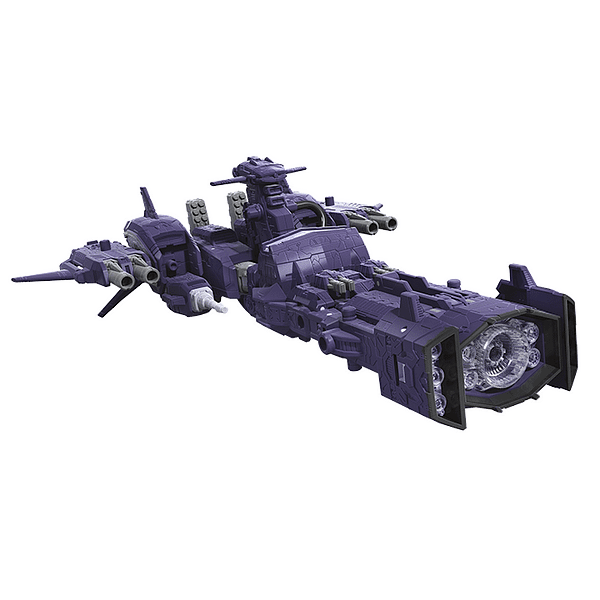 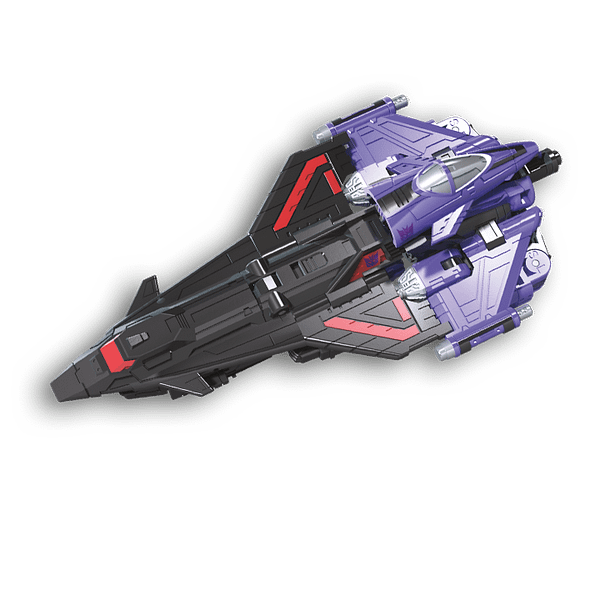 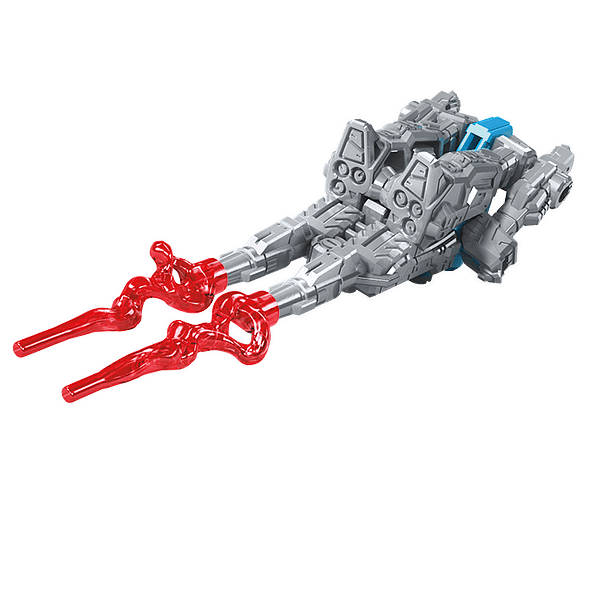 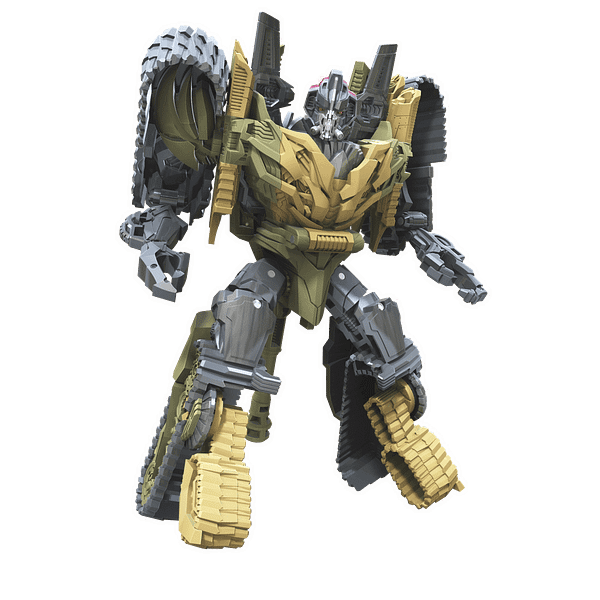 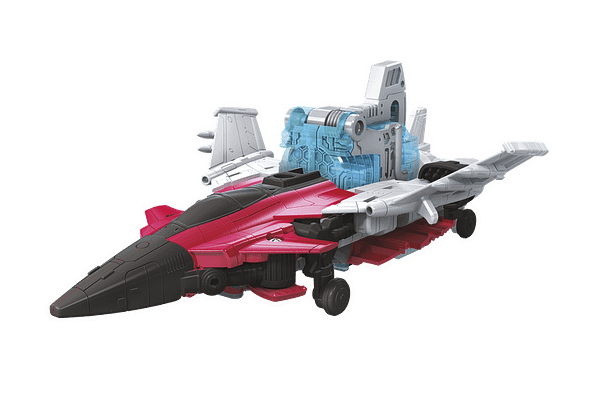 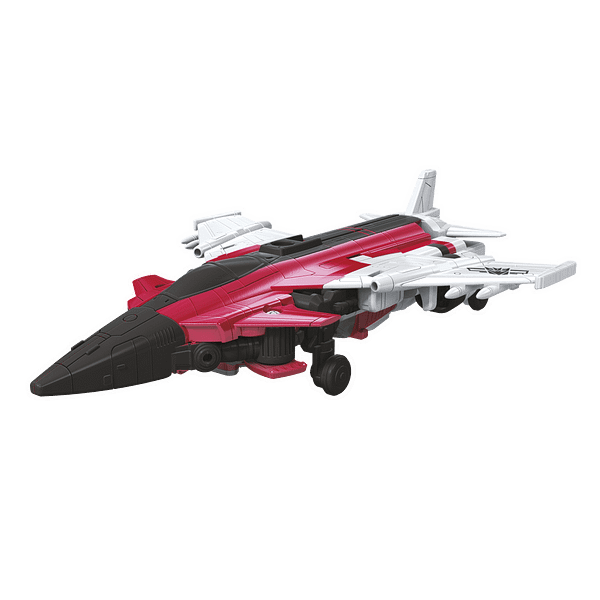 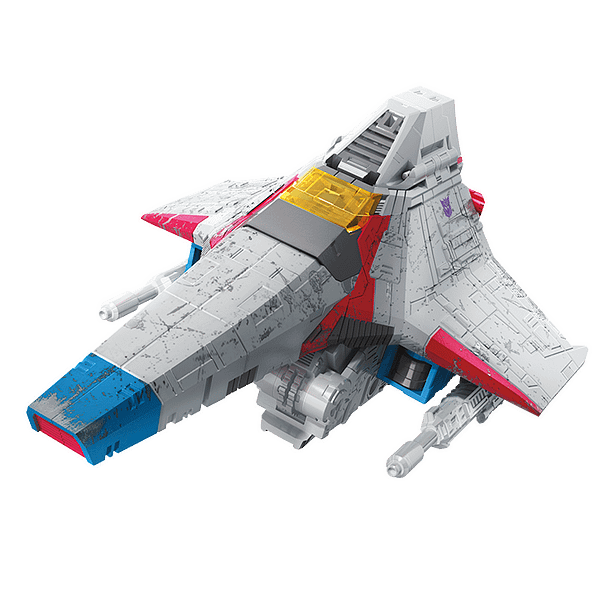 Cyberverse has a wide array of classic characters including Slipstream, the female Seeker Decepticon jet. 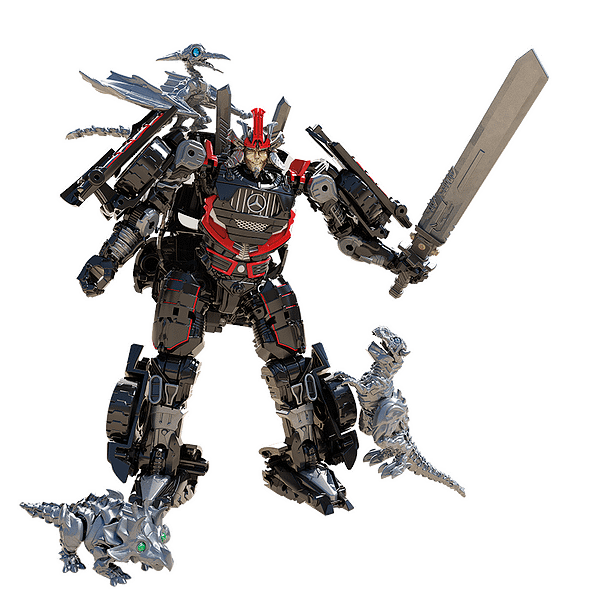 Drift, in his live-action movie form, will be released as part of the Studio Series, partnered with three mini-Dinobots. 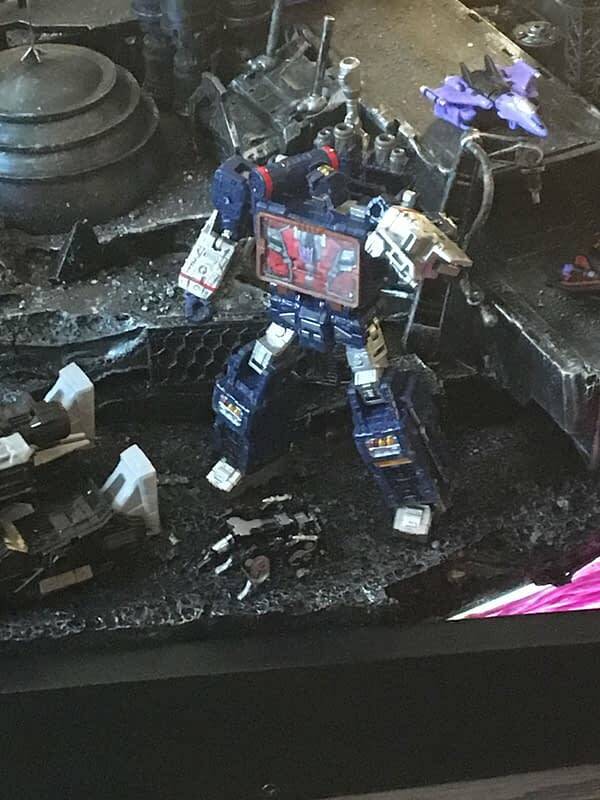 The previously announced G1 re-releases will be as accurate as possible to what was released during the 80s but some additions have been made. 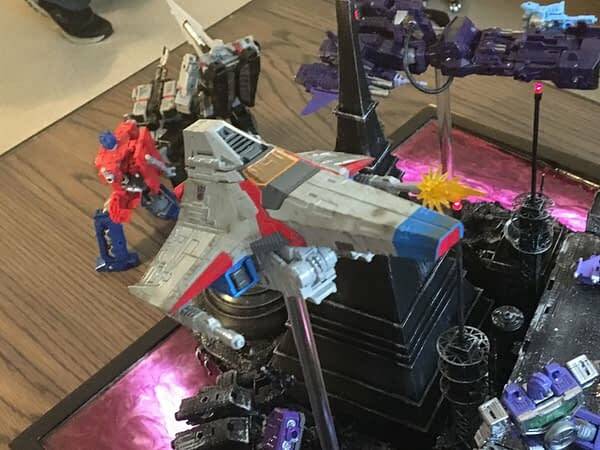 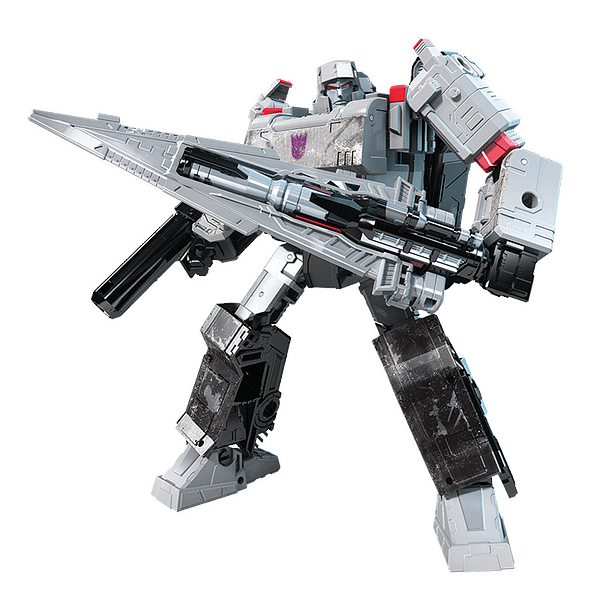 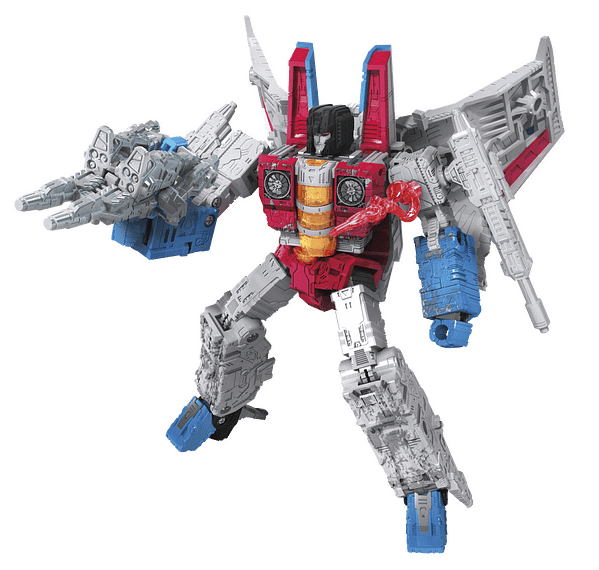 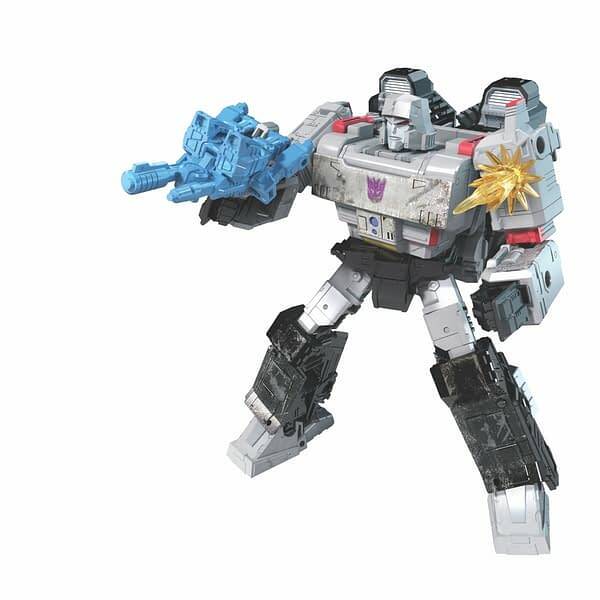 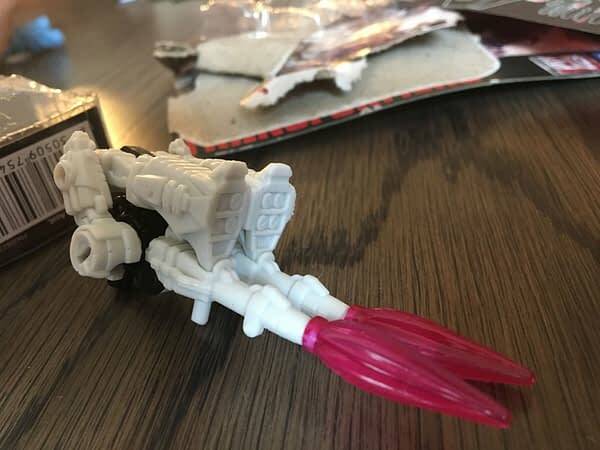 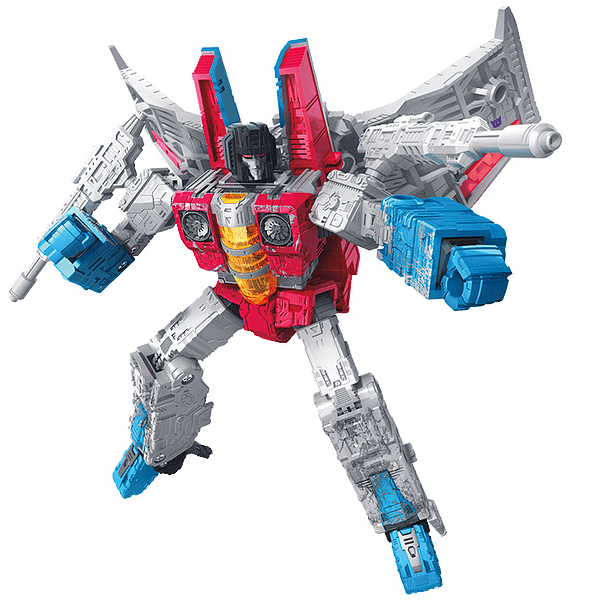 One example is that Starscream will now come packaged with Megatron in his gun mode. 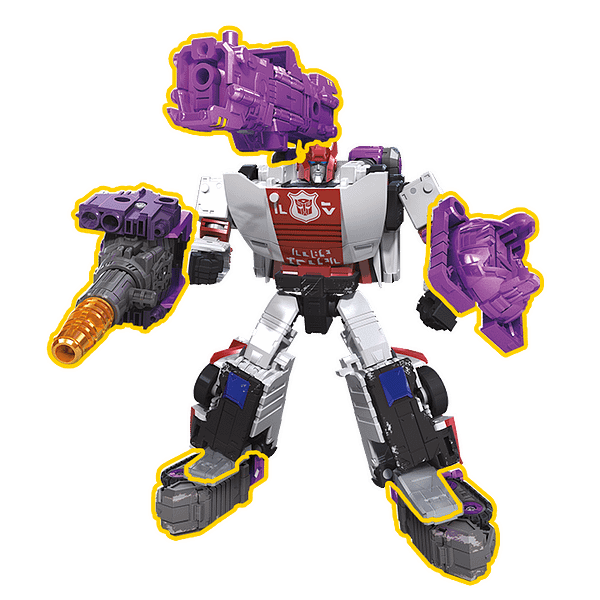 When asked if any Transformer’s design, past or present, was something in particular that the team wanted to rework, Design Manager John Warden replied with classic Decepticon Sixshot. 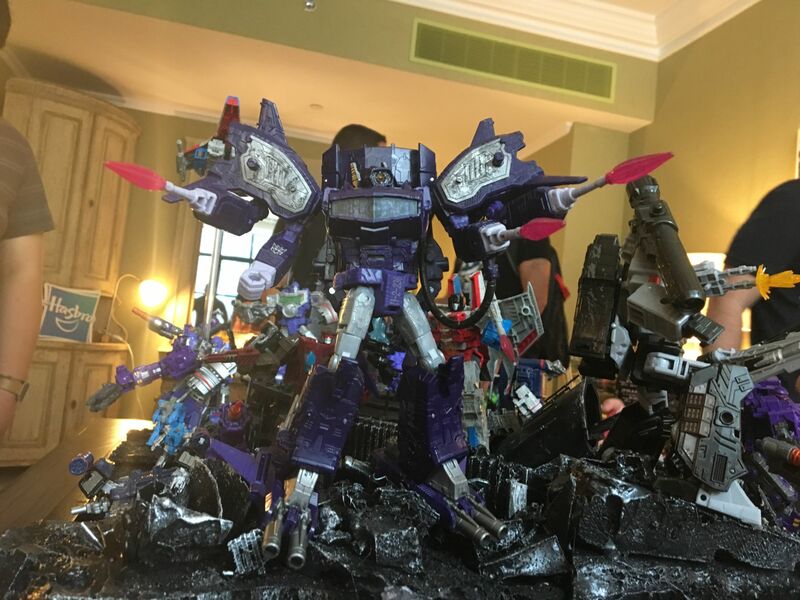 He said that while the original toy “was a bit of a brick” he added that such a great concept would lend itself to some innovative design work if the opportunity presented itself. 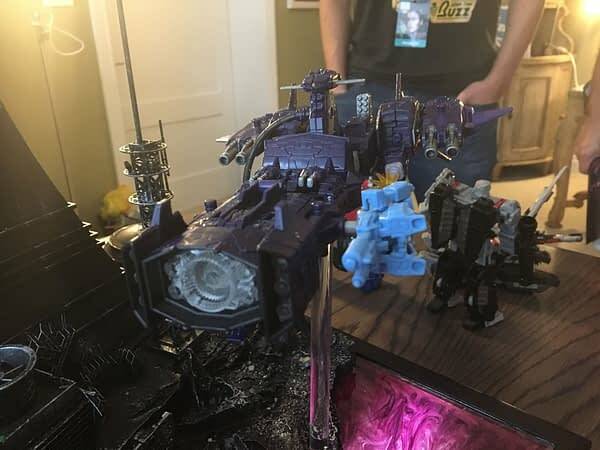 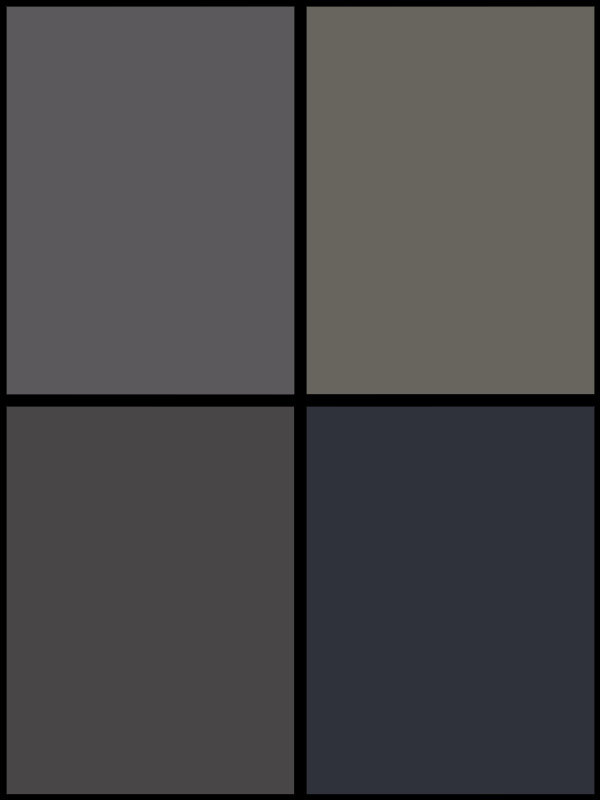 Check out even more pictures below! 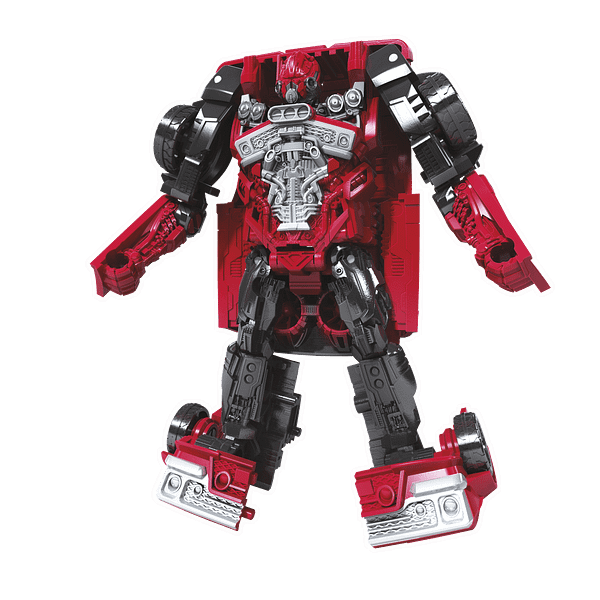 Funko Round-Up: Ronda Rousey, Nicktoons, Boy Meets World, and Tokyo Ghoul!